We are Okan, Donna and Indigo. We've been traveling for almost five months now, and I think it is time to post to this forum (better late then never!). As our title suggests, we left Vancouver on September 27th, 2016 and heading to Ushuaia, Argentina. 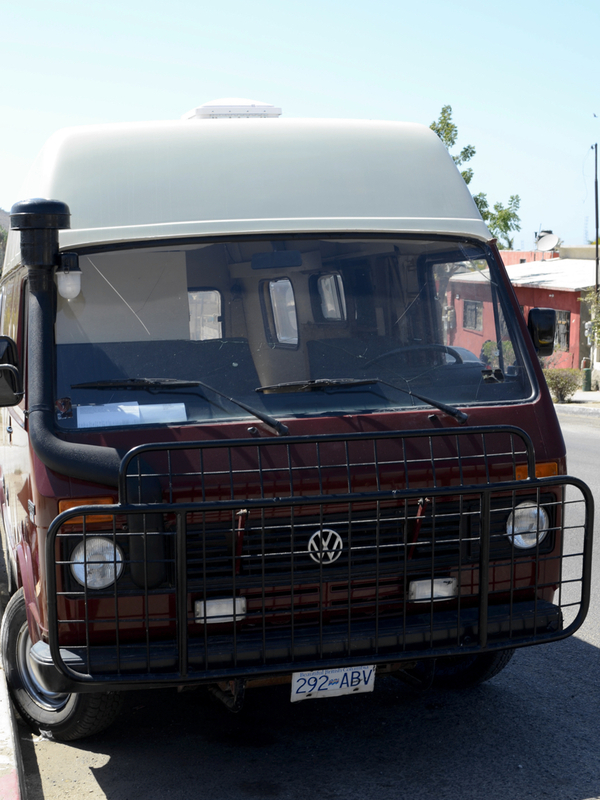 If, and that is a big if, things go well, we will ship our trusted truck "Machete" and our Hallmark Camper from Montevideo, Uruguay to South Africa and travel North and somehow find our way back home. Our travels started with a big detour. We drove to Washington DC and flew to Turkey for 45 days. When we came back to States, we drove to San Francisco, CA to spend holidays with friends and family. 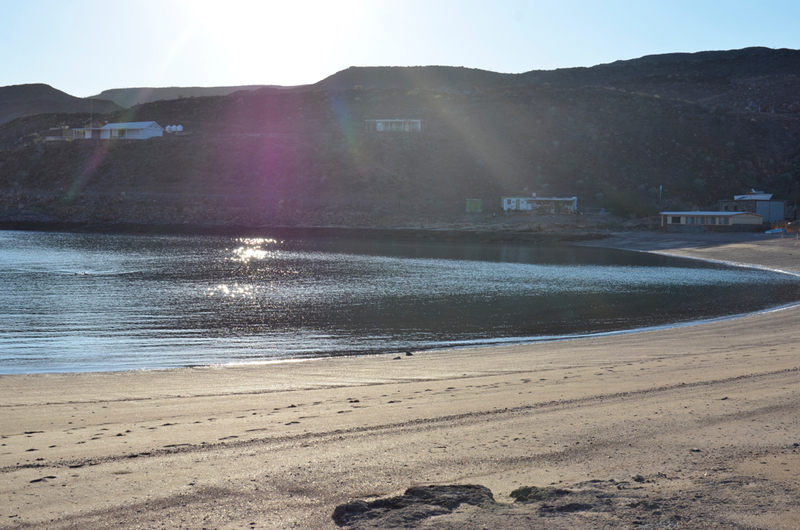 We have crossed into Mexico on January 10th and currently in La Paz, Baja California Sur. Very nice read and I wish you well on your travels. The Natchez Trace is a fun road to take. 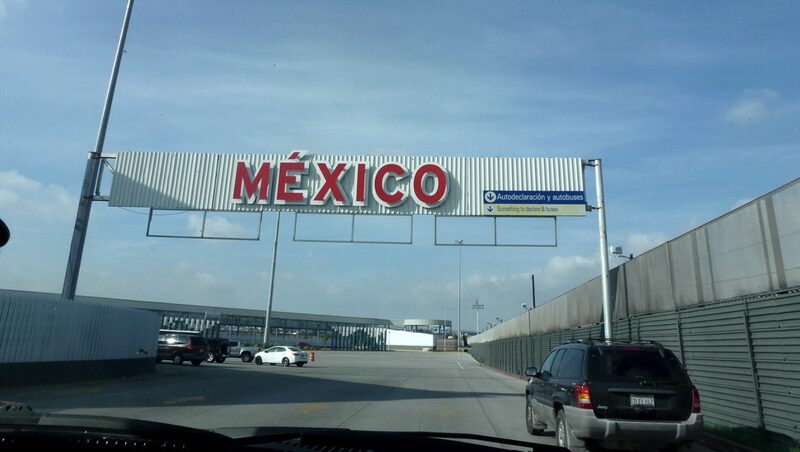 We had been traveling for several months before crossing into Mexico, but this felt like we were really starting our adventure. English would no longer be the primary language; food, infrastructure, and navigating daily life would all be different. We were also listening the latest news closely and constantly. The Mexican government had just eliminated the subsidies for petrol products resulting in a 25% increase on fuel prices. This resulted in massive protests all over Mexico. 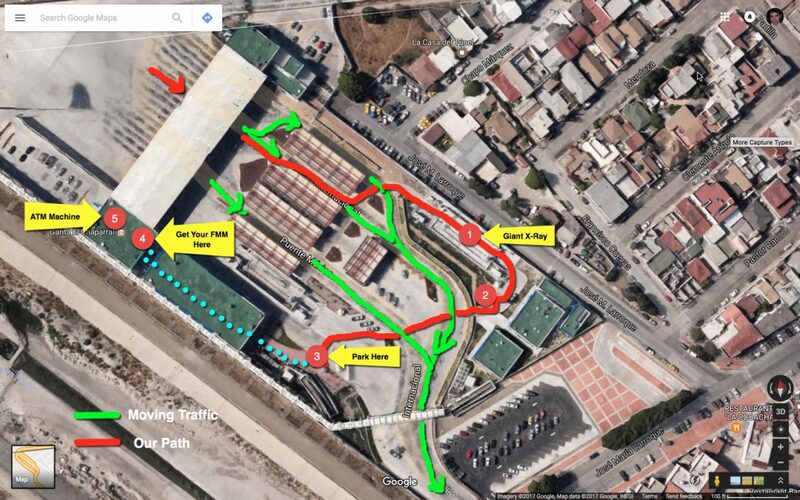 Just two days before we planned to cross the busiest border in the world, the Tijuana crossing was closed down and traffic was re-directed to neighbouring border crossings. The morning of January 10th, we woke early and anxious to get going. No way were we going to set up camp at night our first day in Mexico! After filling our water tank, diesel tank, and our two 5 gallon diesel jerry cans, we headed to the Mexican border. The Tijuana crossing was open, so we followed the fast-moving south bound traffic right into divided lanes as we went under a “Bienvenidos” sign. A Mexican border agent signalled us to get out of the fast-moving lanes, and follow her to the left side of the border area to a giant X-Ray machine (1). We were told to park the truck and walk to a protected area. The agents were very polite and professional. 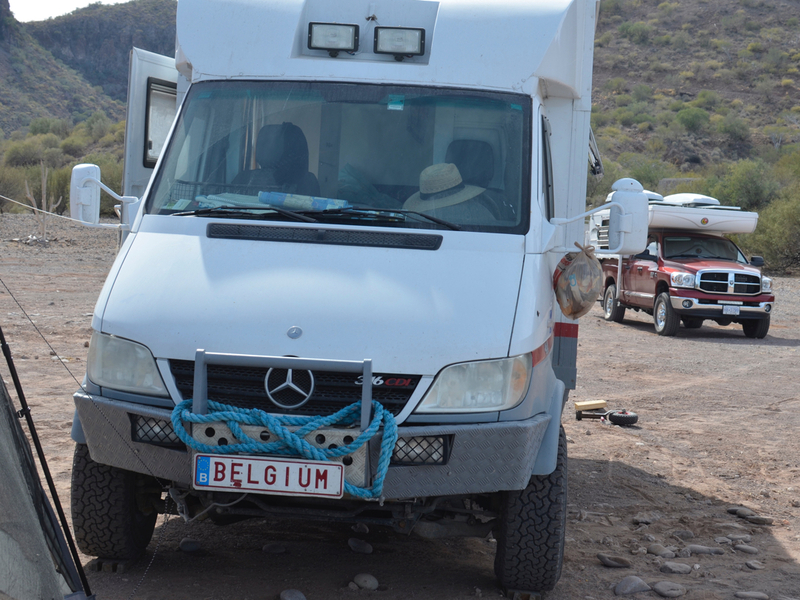 After our truck and camper got scanned by the X-Ray machine, we pulled into a small parking area (2) and was asked to provide our car registration, car insurance, and passports. A junior looking border agent looked a little confused about our Canadian ICBC papers and asked where our DMV papers were. Okan explained that we are from Vancouver, Canada and the ICBC document was the only registration paper we had. She called her superior and after five minutes, we were told we were good to go. At this point, we could have just continued driving south to Baja, but we still had to get our FFMs (Tourist Card) stamped. 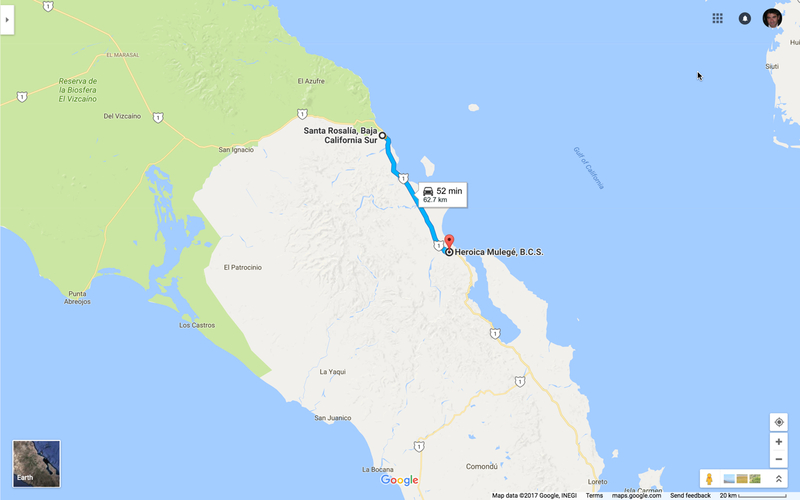 10 days prior to crossing Okan became a member of Discover Baja Travel Club ($39/year) which is the only institution that can issue an FFM in advance (but they still need to be stamped by a border agent!) The application process was pretty easy, download the form, then fax or email the completed form back to Discover Baja along with payment information ($35/person). We received the FFMs back as a PDF along with bank receipts via email in two days. To get our FFMs stamped, we had to get to the opposite side of the border crossing area. This meant we had to cross the fast-moving lanes of traffic and dodge folks anxious to escape the USA. There is a place to park near the bus parking (3), and we walked (dotted line) through one large building to get to the small office. It probably would have taken us a little longer to find the office, were we not greeted by a young volunteer who asked in perfect english what we needed, and directed us to the directly to the right office (4). The border agent inside the office was also super polite and smiling, and stamped our papers. We just needed to jump back in the truck and leave, that was all there was to it. The whole process took only 30 minutes. There are two ATM machines (5) right next to the border agents office. Okan got some Mexican pesos and we were on our way to Ensenada. In true Driven To Wander style, we took multiple wrong turns immediately upon leaving the border crossing. It still amazes me with the research we do before we drive, the Garmin on the windshield, Google Maps on the iPad mounted on the dash, audio navigation that automatically lowers the radio when prompting the next turn, plus me pointing wildly “go this way”….that we get lost so often. I would love to take on a section of our trip, with no electronics and just the paper map and reading road signs. We’d probably see a lot more of the surrounding area if we stared more outside the windshield than inside the car. Because of all the wrong turns, Okan and I were getting very stressed, especially when we got into a sketchy neighbourhood. We finally approached a toll-booth and tried to quickly sort out which toll rate was for us. The toll booth operator was so kind, relaxed, and personable, that Okan said the conversation immediately made his stress level dissipate. It seemed that no matter what was to happen, Mexico was going to be filled with kind people helping us along the way. 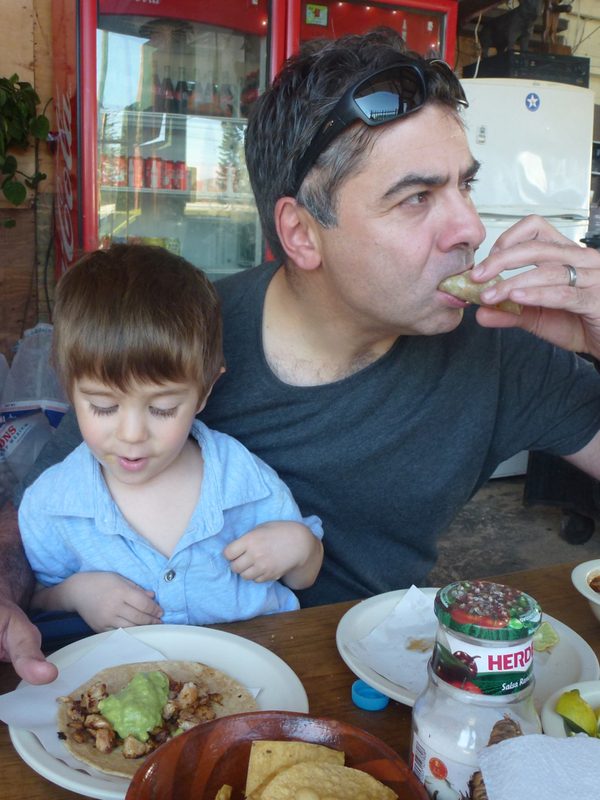 We managed to find our way to Ensenada, park in town, and get our first Mexican taco de pollo…Success! Now fed, we were off to find a campsite south of town. We pulled up to the first campsite chosen on iOverlander, only to realize it was on a cliff overlooking the ocean. I had been telling Indigo we’d be heading to the beach for days, and aside from that I was worried he’d fall off the cliff. 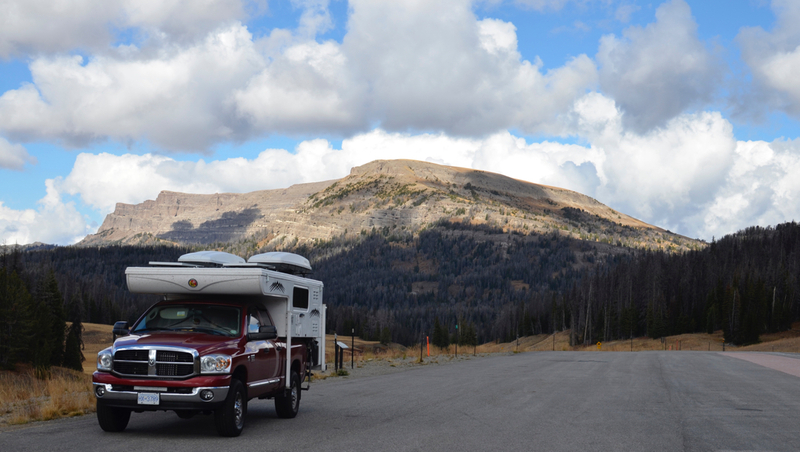 So we headed back down the mountain, and pulled into the first RV camp at sea level we found, because as you may have guessed if you’ve been reading our other blogs…it was getting late and would soon be dusk, if not dark. 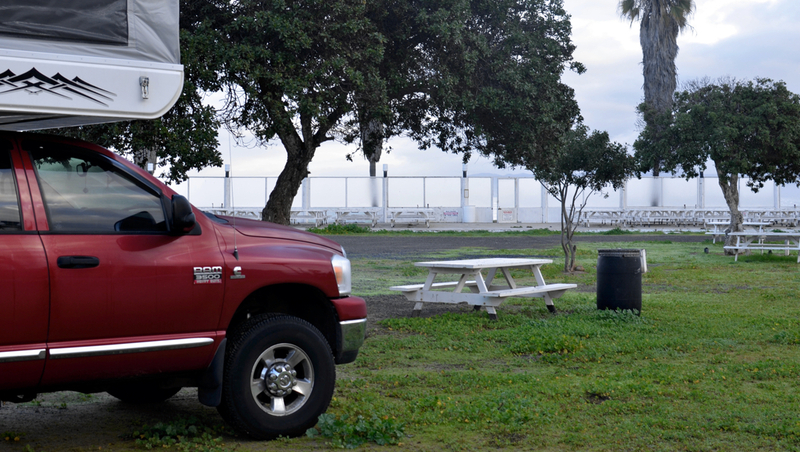 The campsite was empty except one other truck camper, a bit outdated and worn, but had decent bathrooms, felt safe, had beach access, and a market next door. The bad weather continued to follow us into Mexico, so we walked to the ocean upon arriving to take a peek with no intention of getting wet in the early evening. Our first look at the ocean turned into first kicking off the shoes, then rolling up the pants, and then going whole hog. Indigo stripped out of his clothes bit by bit while playing, until he was naked. After several hours of play we took our shivering naked boy back to the camper to warm up. On our second day, we had a similar beach experience, never meaning to really get in, but Indigo stripping down and jumping in anyway. 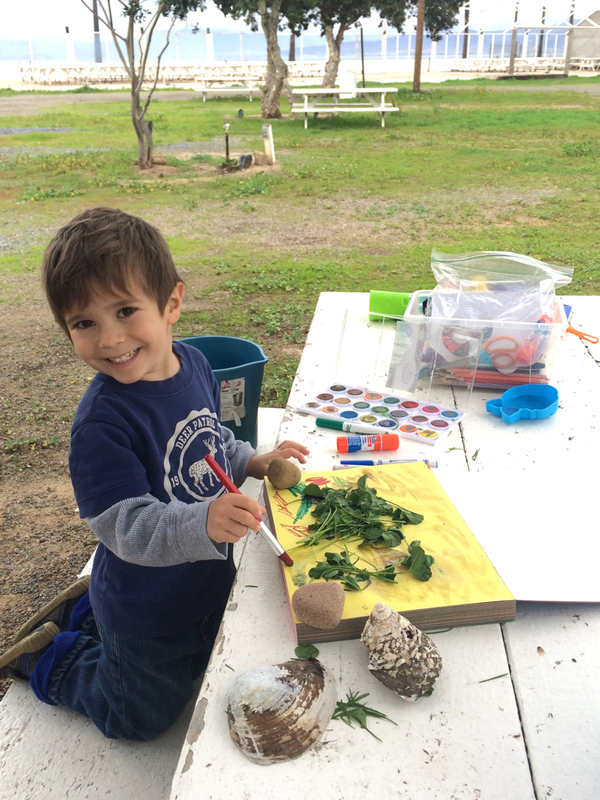 I had a proud mom-moments at this campsite by getting out the art supplies, and watching Indigo use pieces of plants and shells to create art. I am still navigating what works best in regards to crayons, markers, paints, or colored pencils. But the glue sticks rock, and are a staple in our art supplies now. 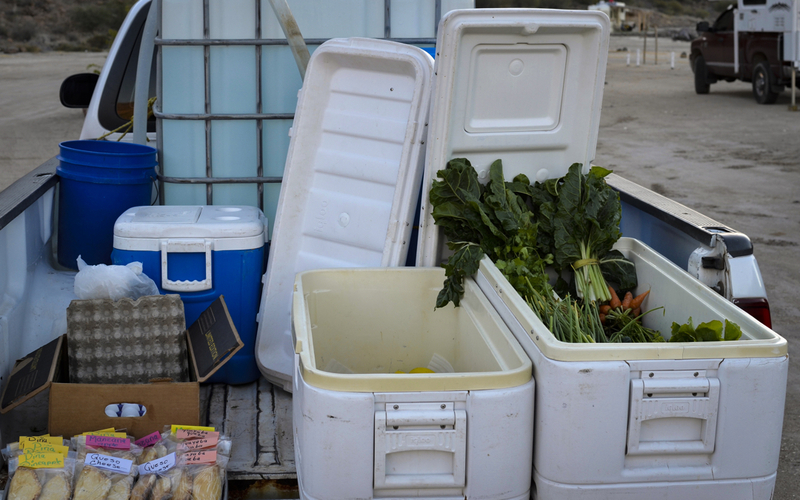 We frequented the small market outside the campground several times. No english was spoken, but smiles and gestures, and Okan’s limited Spanish was all that was needed to sort out the wifi, and buy some groceries. And the first of many candies were offered to Indigo as he chatters away in English, not really seeming to care that his words are not being understood. When he has something to say, he just can’t hold back. 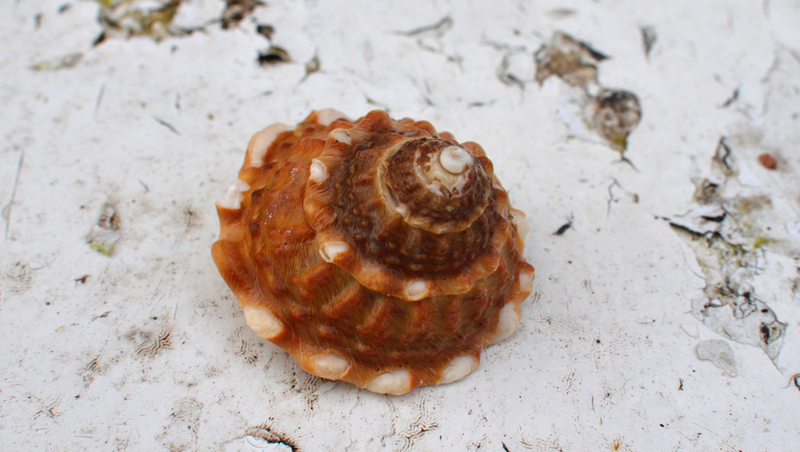 Okan picked the first of what would become a growing seashell collection from the Ensenada beach. So far the collection is manageable in the camper, but only time will tell. 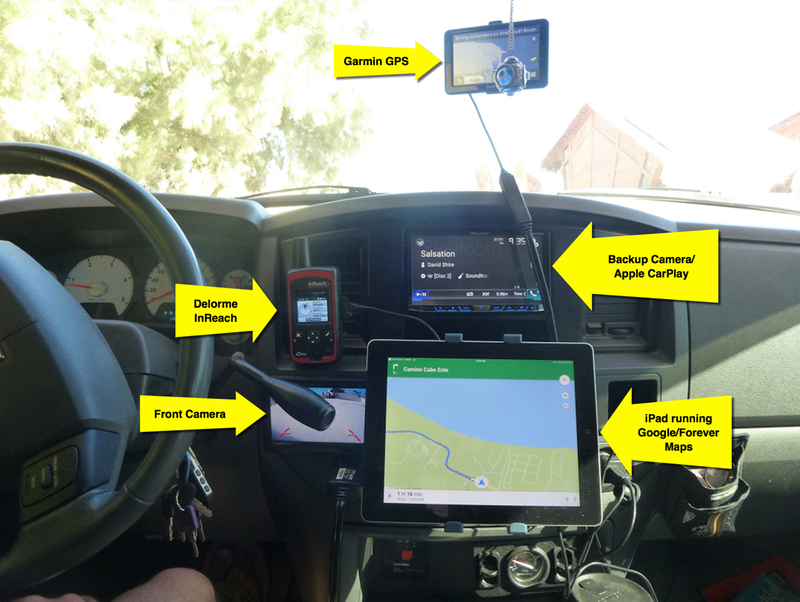 When I was planning for this trip, I wanted to see how others navigate and what they use in their rigs. So, here is what I have been using on my dashboard. Garmin GPS: Although I use Ipad as my main navigation tool, it is nice to have secondary GPS. I love that I can glance and see my current speed vs speed limit. I am sure it saved me getting some tickets already. I also find that Garmin gives better estimation for "time to destination" compared to Google Maps. If Donna is sleeping, or busy with Indigo I can voice command Garmin to navigate. I have downloaded all the OSM maps for Central and South America. I will give another report once I am out of Mexico and start using OSM maps. Pioneer with Apple CarPlay: I have yet to use Apple's Maps on this trip. I love Apple products but CarPlay is still too buggy and Apple maps is not as good as Google maps. Pioneer unit is awesome though. DeLorme Inreach Explorer: This Unit connects with Earthmate software in Ipad via bluetooth and gives me another map that is always on and accurate. I can see my routes, waypoints and history. Earthmate shows topo maps, satellite image or road maps. It outputs our location into a map for our website so our friends and family know where we are. It lets us send and receive text messages. It can trigger interactive SOS. Equipped with a digital compass, barometric altimeter, accelerometer and odometer; display trip time, max speed, moving average. This thing is a must have. Front Camera: I usually leave it on but use it mostly when I am getting in or out of a parking spots. Chasing the Sun to the Sea of Cortez! 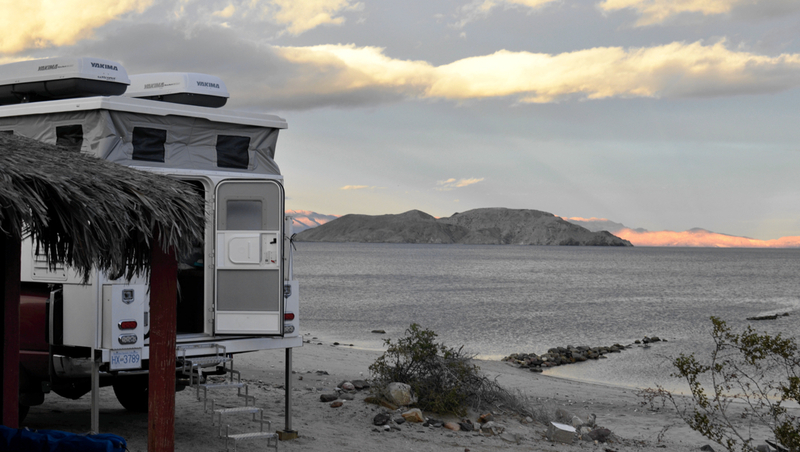 I had read and daydreamed about Baja for years. 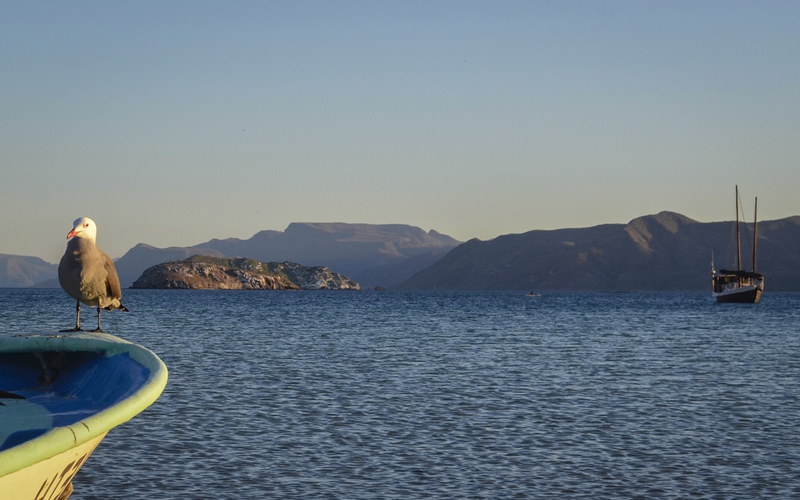 My mind would escape boring tasks and find refuge in thoughts of Baja's beautiful beaches, rich marine life and fish tacos. When our trip became reality, I was afraid I built up too many expectations and I was going to be disappointed. 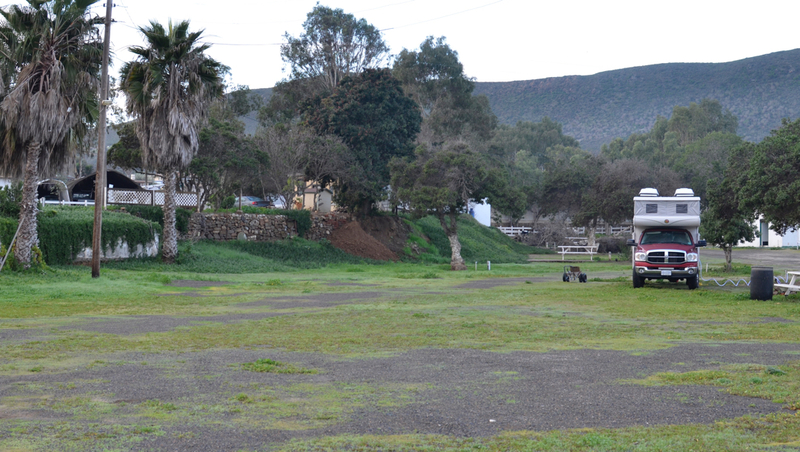 We had a glimpse of the possibilities at Villarino RV Park in Ensenada, but by the second day the cold and rainy weather that was following us since Washington DC caught up to us. 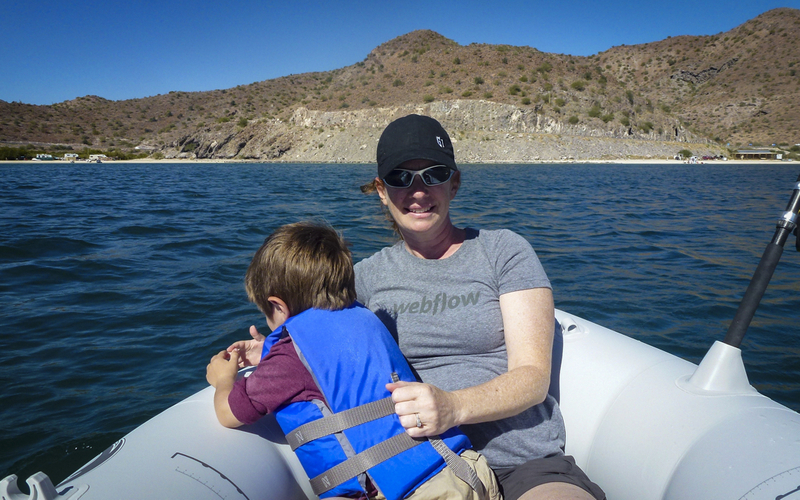 We were eager to find warmer climate and calmer waters so we decided to head to the Sea of Cortez. 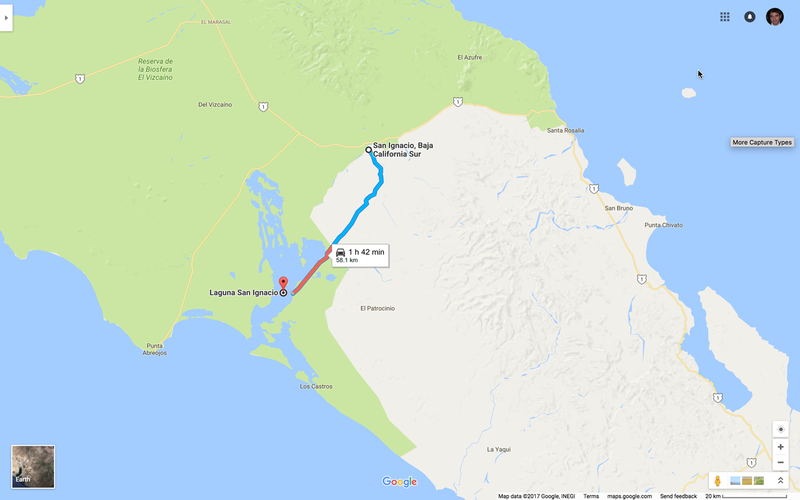 We left the campground around 10 am and looked for Mex 3 which runs from Ensenada to meet with Mex 5 about 31 miles north of San Felipe. 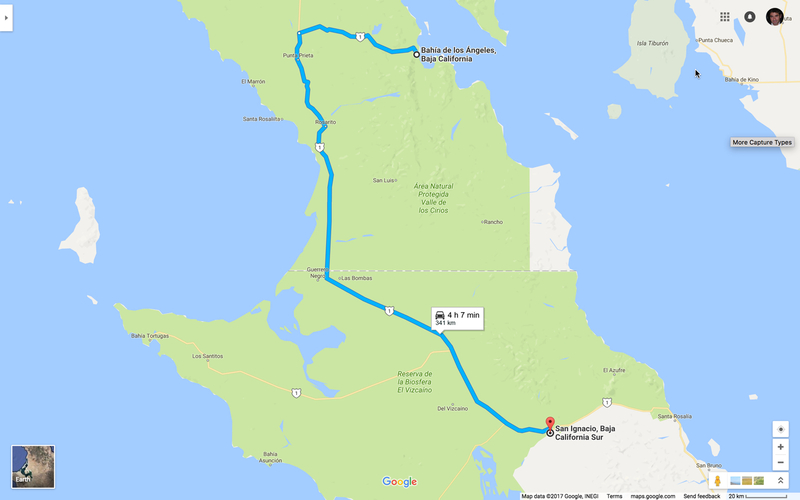 We realized that Google Maps' travel estimates were even more off than when we traveled in the United States, the drive took us over 4 hours. The road started to climb right after Ensenada and we got stuck behind a slow moving tanker on a no pass narrow road. I get a little jittery when the transmission temperature goes over 190 F, so I was watching the Gauge2 closely. Once we reached 4000 ft, the road flattened out and we were the only vehicle on the road through the mountains. The transmission temperature dropped back down, along with my worries. There were 2 military check points, one at mid way and one just before Mex 3 merges to Mex 5. The soldiers were polite, greeted us with smiles and asked us the same 3 questions; where are we going? where have we been? and, are we on vacation? No papers were requested and were free to continue. The military check-points are not intimidating and feel more like toll-stops. 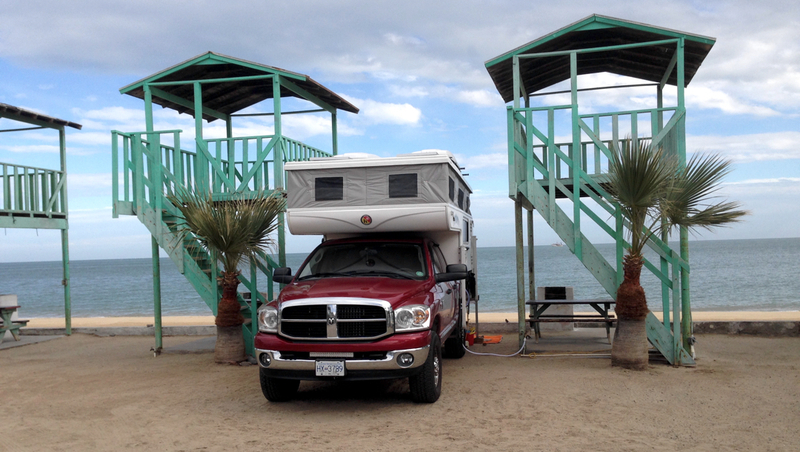 We reached San Felipe in the afternoon and pulled into Kiki's Rv Camping. I chose this campground because I heard it had a lot of character and Kiki took care of her customers. But, all of the beach front spots were occupied by permanent big rigs from Canada, more specifically from British Columbia, and even more specifically from Vancouver Island. 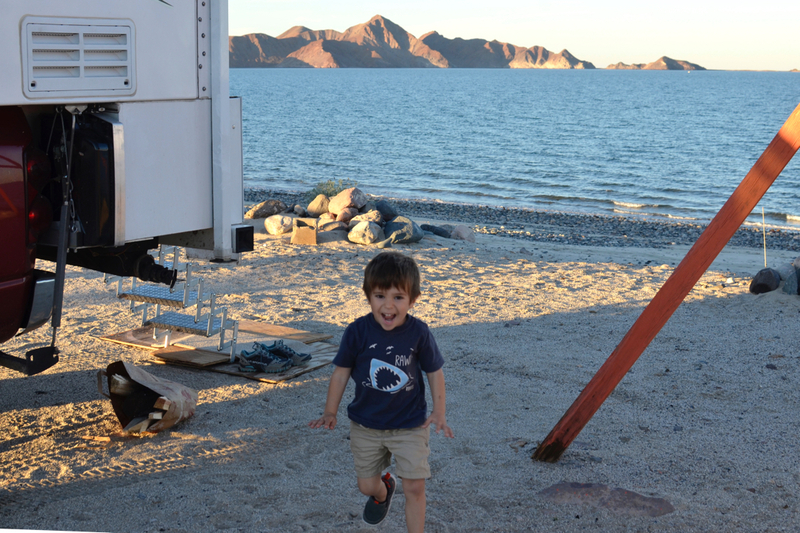 Although we really liked Kiki's spotless bathrooms, we ultimately decided to camp at La Palapa Rv Camp. One of our biggest sticking points while traveling is Donna's obsession to be in the best camp spot possible. Donna is very particular about how the camper is parked, in which spot, where it faces, and if this or that campground is the best campground, or best spot within the campground we could pick. I'm surprised she does not pull out a spreadsheet, list the pros and cons of each choice, weight the answers, and pick based on some scientific method. On the other hand, I pull up to the first spot and park....well, not anymore. She made me leave Kiki's RV Park where I was willing to settle on a corner spot along a wall that had a small patch of sand. I am so glad she insisted we move. 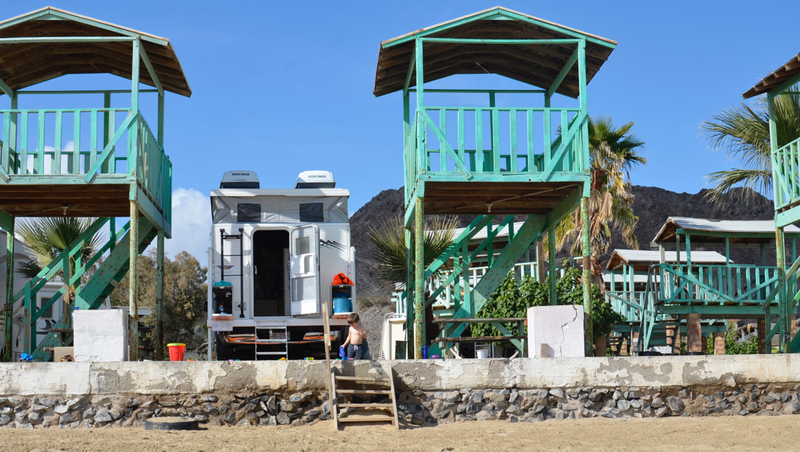 Although the bathrooms were not as nice, everything else at La Palapa RV Camp made up for it and more. 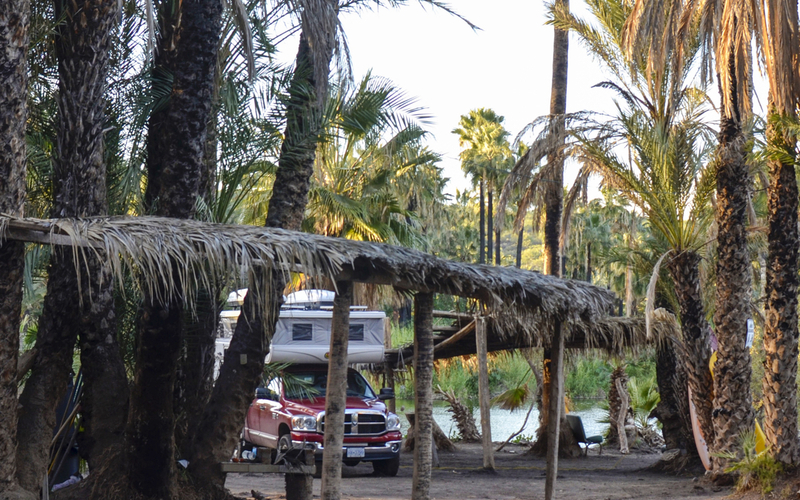 La Palapa RV camp is located right next to once popular Ruben's. It has two-story ramadas. We were able to get one of the six prime spots along the front next to the beach. 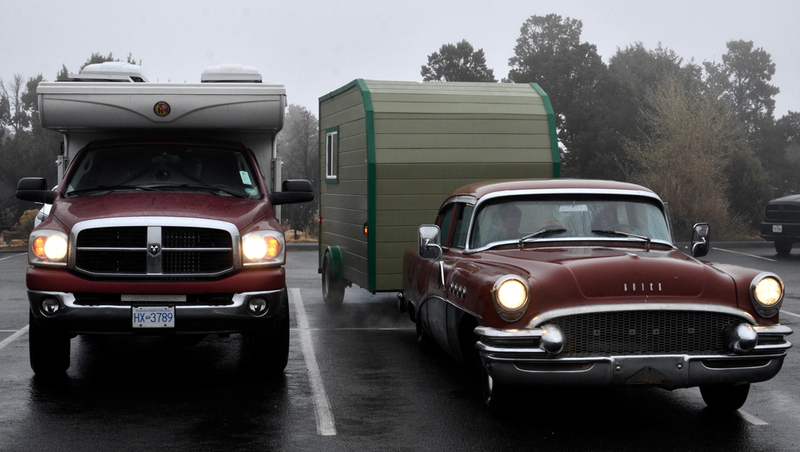 These spots can accommodate smaller rigs like us perfectly, but are too short for the big RVs. 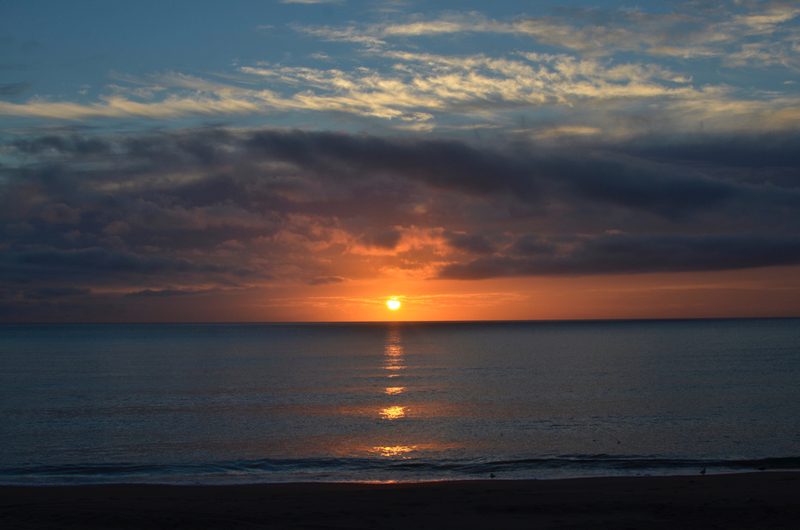 Based on our first morning's spectacular sunrise, things were looking good for our stay in San Felipe. Indigo had a great time at this campsite. 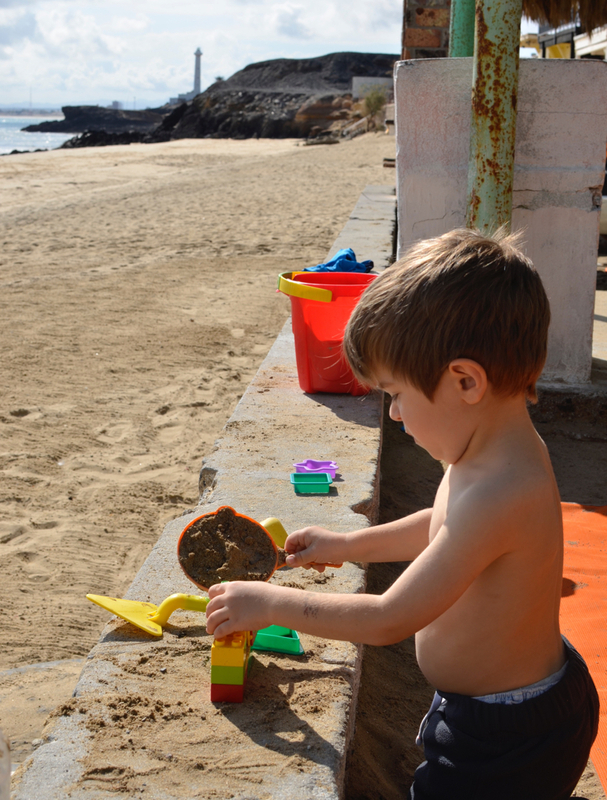 Every day was spent making sand castles, sand holes (for no other reason than to make a hole), and pretend cooking&#8230;with of course sand. The water was still cold, but he was able to go in waist high to try clam digging in the mornings. 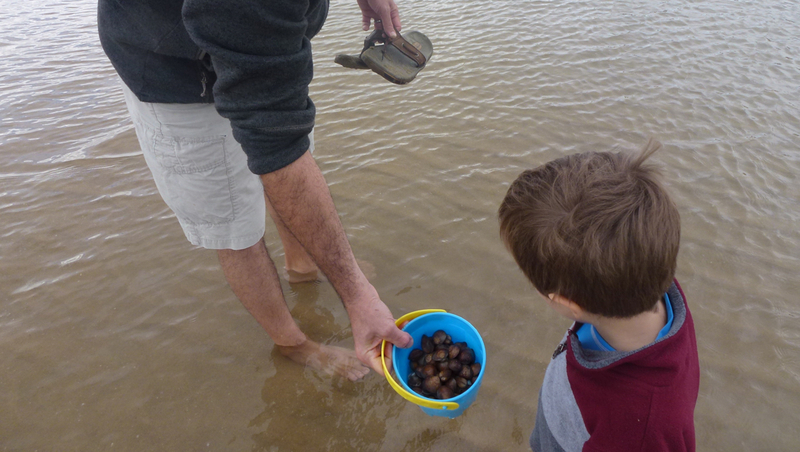 We threw them all back at sea as they were all too tiny, but it was a great morning adventure for all of us. It feels good to recognize which little hole in the sand actually has a clam in it! We were also thrilled about the bright orange sand mat we had bought. Sand sifts right through the holes, and miraculously does not come back up! 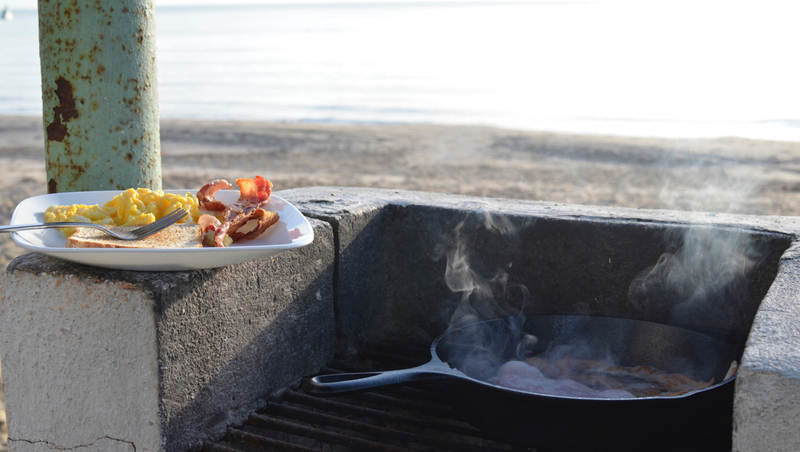 Perfect for being camped right on the beach. As an added bonus, the campsite came with a great set of neighbours during our stay. A retired couple from Canada, a young couple from Argentina who were photographers, and a solo motorcycle rider from Texas, who had been a teacher in the Australian outback. It didn't take long after settling before we were swapping stories, and sharing beers. We discovered that the Argentinean couple (Wanomads) are good friends with the families also known as Our Open Road and Crepe Attack. These are two families that we admired and followed for years before starting our own trip. 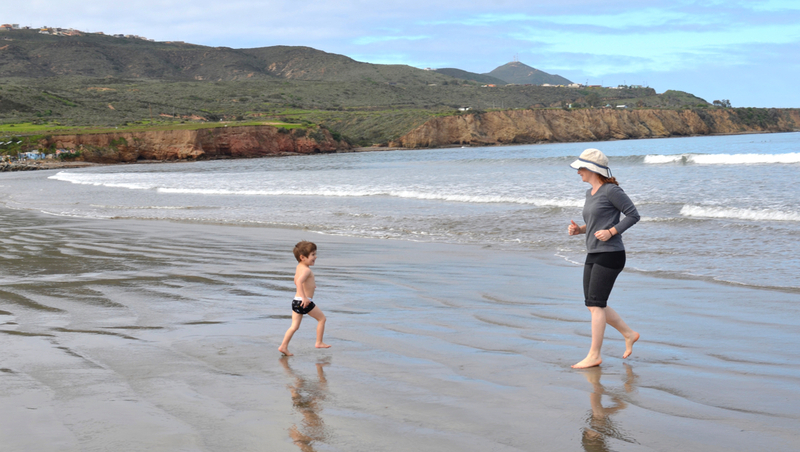 Donna wrote to Our Open Road with questions about traveling with kids, and they readily and warmly responded with advice and tips. We visited Katie of Crepe Attack as we traveled through Tennessee and learned even more. 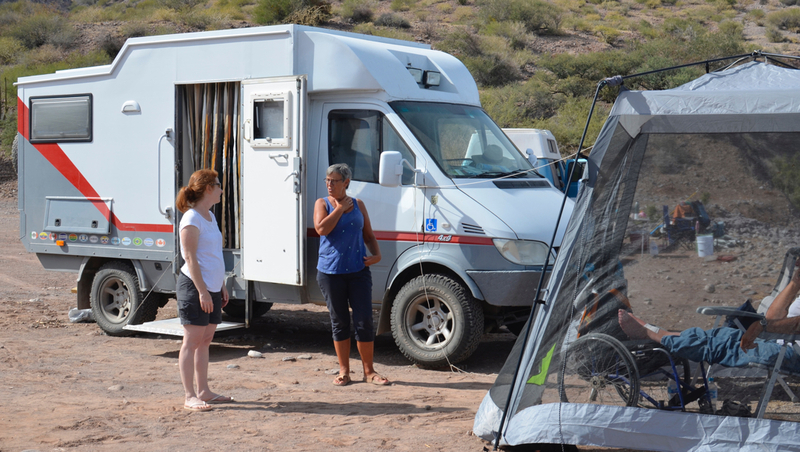 The community of overlanders and long term travellers is a warm and welcoming collection of people, and have made the places we've traveled that much more enjoyable. 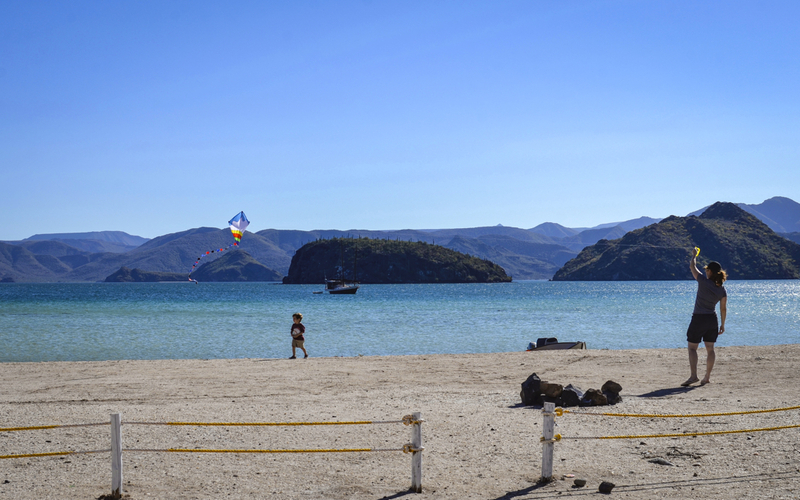 So in the end, Baja with it's vultures carving circles against blue sky, the cactus dotted landscapes, elegant pelicans diving for fish, and best of all the warm and laid back people, is a magical place. 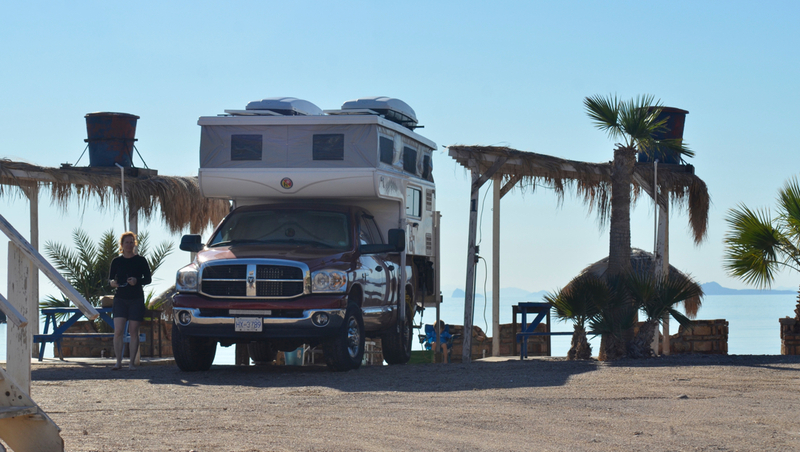 Although the weather could have been a bit warmer, our experience in San Felipe, lived up to my expectations of what traveling in Baja would be like. Looks like a wicked trip! FYI, a lot of your photos are not showing up - you need to make them publicly accessible in your Google account (they will show up for you because you'll be logged in). 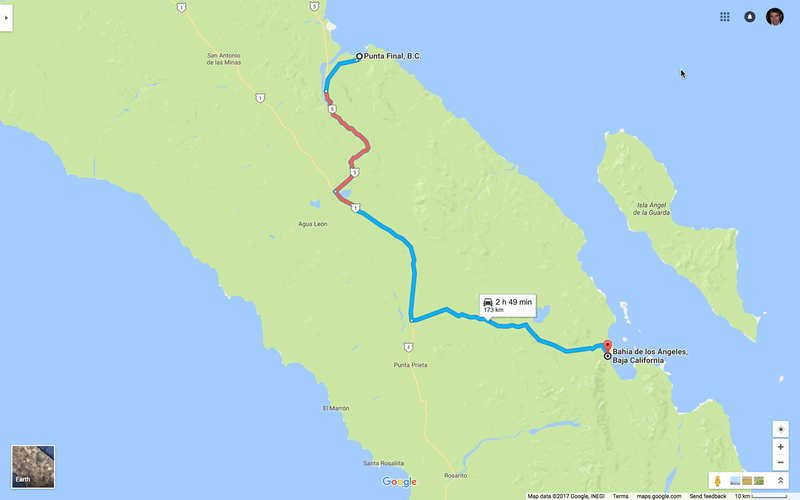 And thanks for detailing the border crossing - I'll be taking the same route this October and this post will definitely come in handy! Thanks for your note. Turns out Google Photos doesn't let you share photos on other websites nicely, or without changing the size. Switched to Flickr and that did the trick. Hope you can see them now. 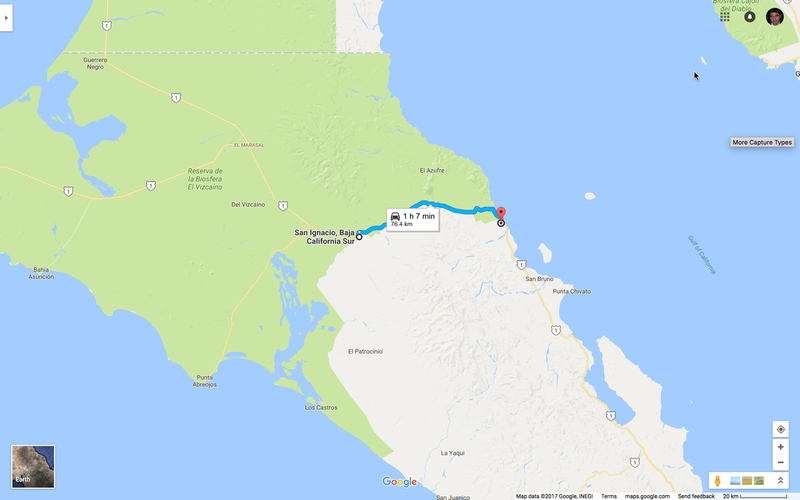 We loved being in San Felipe, but the weather reports were calling for rain, and we thought we'd hit the road instead of staying indoors in gloomy weather while we could be driving to a new adventure. 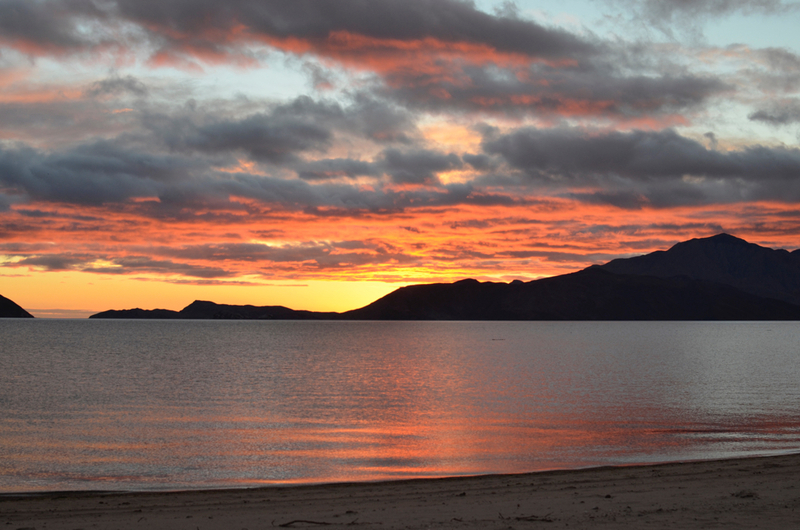 We decided to hug the eastern coast of Baja, and stick with the Sea of Cortez and magnificent sunrises. 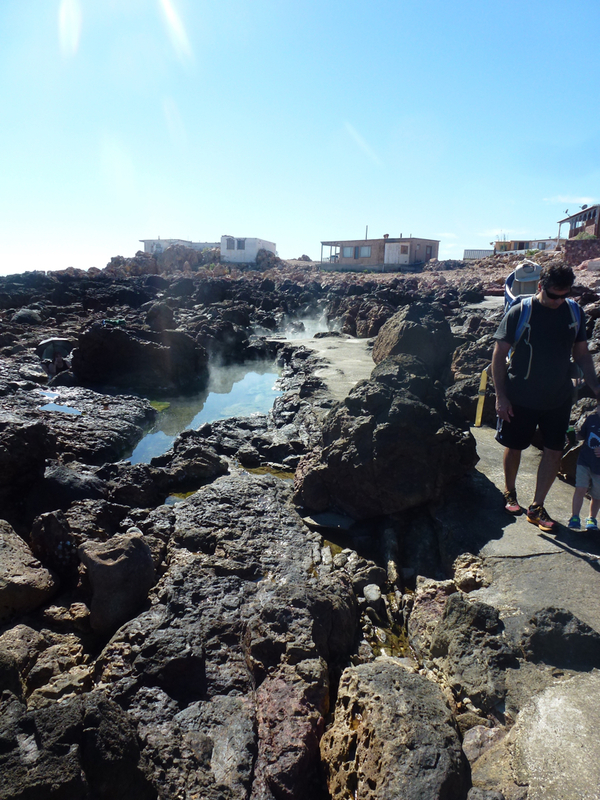 Our next stop was Puertecitos, a very small town with one main attraction...a natural hot springs. We were the only ones at the tiny cove when we arrived at mid-day. We couldn't help but wonder why we didn't see at least some fisherman about, because there were fish jumping out of the water all over the small cove. Sometimes you could see 4 or 5 in the air at the same time. It was as if the water were hot and they were trying to escape. Okan fished for a while, but only the Pelicans were having luck at catching them. Aside from one boat wreck on the beach, there wasn't anything around, which made me intent on experiencing the hot springs at its fullest, at low tide when all three tide pools would be accessible. I incorrectly thought it the tide was coming in when we arrived, and was distressed thinking we'd have to wait until midday the following day, which would delay our drive to the next destination. When we awoke to a muddy field I was happy to realize I was very wrong about low tide, and we could have an early morning dip, and have enough time for our drive. Several motorcyclists from Oregon and a couple from Ohio joined us in the hot springs and we swapped travel stories while alternating between the hottest area in the coolest of the 3 tide pools. I needed have worried about seeing the pools at low or high tide, because I could only handle the heat of the pool closet to the sea, and never made it to the two hotter pools! After our soak, we headed to Gonzaga Bay...and drove on our first of what would be many washboard roads. Nothing like a bumpy road to remind you that you need to lose a few jiggly pounds! Gonzaga Bay Camping was very remote, mainly for fisherman, and again we were the only people at the campsite. We stayed at Camp Baluga, run by a nice family who popped in to make sure we were settled. We enjoyed a magnificent fire, almost a bonfire, since we had the whole day to gather any and all wood in the area. But the highlight was staring at the endless stars late into the night...at least until 9:00pm! Indigo learned about Orion's Belt, the big dipper, and of course fell in love with fire-making. 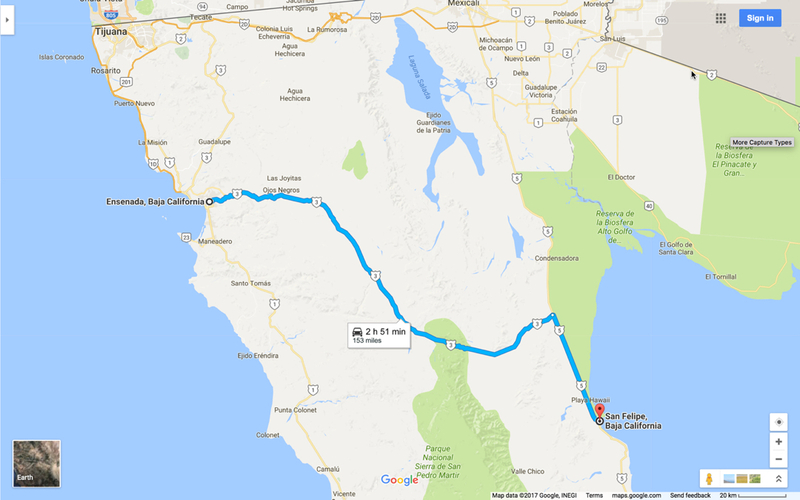 The road between Gonzaga Bay and our next stop in Bahia de Los Angeles was the most grueling drive. The highway is not finished and we criss-crossed back and forth across the "soon-to-be-built" highway in the making. Okan had to pressure down the tires to 25 psi and next 40 miles (in red above) took us 2 hours to drive, and we wanted to kiss the "smooth road" when we finally met up with Mex 1 again. We took a wrong turn on the way to our next campground, and got stuck in soft sand when trying to turn around. I wanted to break out our fancy sand ladders, but Okan managed to get us out with some boards he found strewn about and engaging Machete's 4 wheel drive. Maybe next time! We chose Camp Archelon because it was the most scenic campground, and we liked that it had the only recycling in the area. We were surprised to roll into a fully packed campground, with only one palapa next to the fish-cutting stand available. 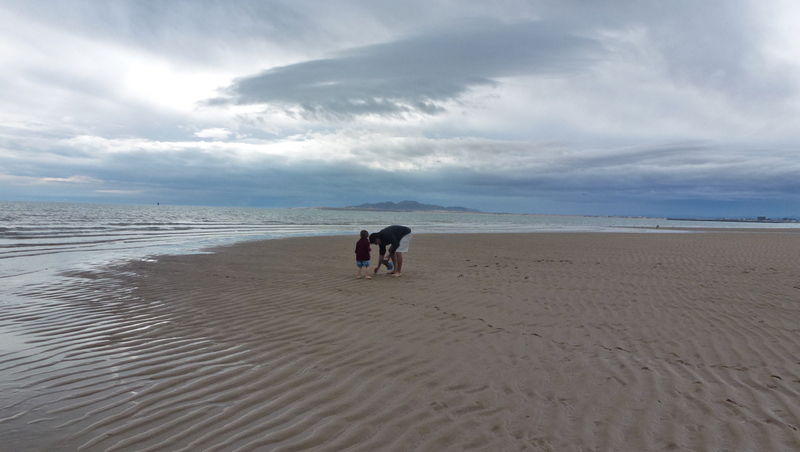 The weather was still gloomy, but we loved the feel of the beach, and the view of the islands across the bay. There was no wifi at the campground, with no intention to provide it in the near future. Apparently there have been debates on a way to bring connectivity that won't destroy the environmentally friendly vibe and goals of the campground. We actually loved not having the internet available, as this campground attracts people that seem most comfortable while unplugged and getting to know their neighbours. We were invited to a get-together with the other campers that evening, who just met each other that week, and who all just happened to play music. We enjoyed a great jam session to which Indigo proudly brought his own ukulele, but was to shy to actually play. 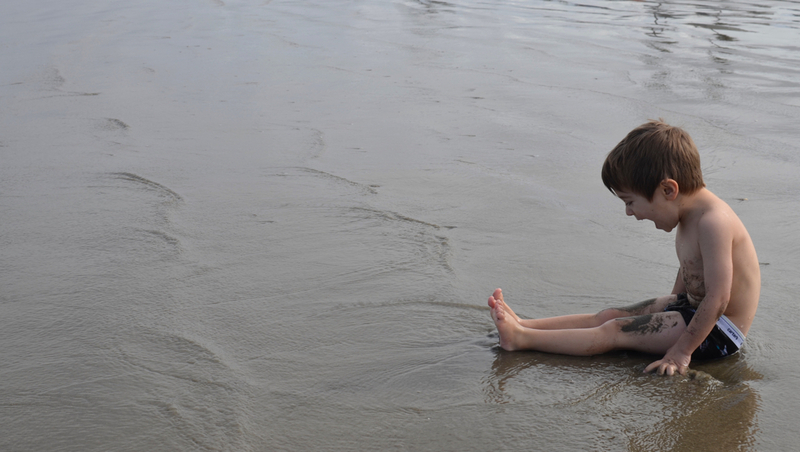 Indigo particular became fond of Bob, who he kept busy on the beach earlier in the day playing freeze tag. The fact that Bob played the Harmonica at the jam session just further endeared Indigo to him. It was also nice getting to know the owner Antonio, who returned home to run the campground with his mother when his father died the previous year. Antony is well traveled, well educated, and has great perspectives on his country and people, as it relates to the greater picture. We wish him much success. 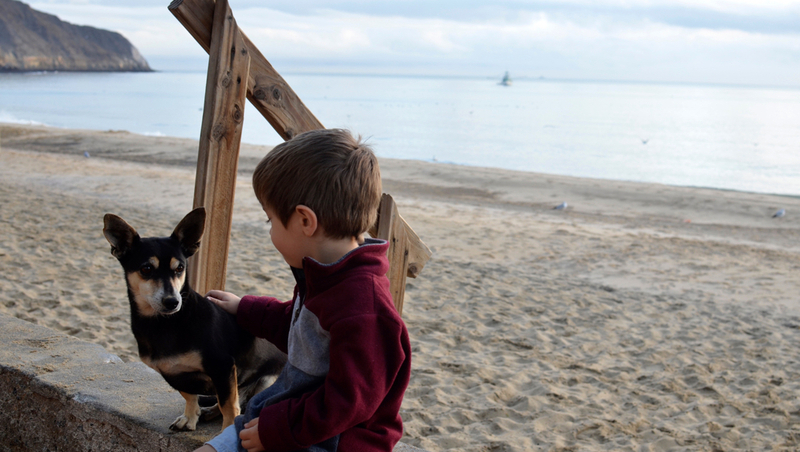 Antonio has several sweet dogs, and they became particularly fond of Indigo. The Belgium Shepard puppy was so excited every time he saw Indigo run (someone his size perhaps? ), he would immediately jump and knock him down and start licking him. This resulted in screams of help help, and we must have rescued Indigo at least 6 times. Even the older pug got in on the action and managed to knock him down once. Indigo must be just so lickable! While here, my fascination with Pelicans continued to grow, and I walked up and down the beach pestering two Pelicans to please hold still and pose for me. I never thought to notice a Pelican before, and now I will stop in my tracks to watch one sweep low across the water, rise quickly and quietly into the air, then deftly plummet into the sea like a missile. We made the decision to leave this great beach, with its amazing sunsets and numerous pods of dolphins swimming past the beach, because yet another new storm was approaching. 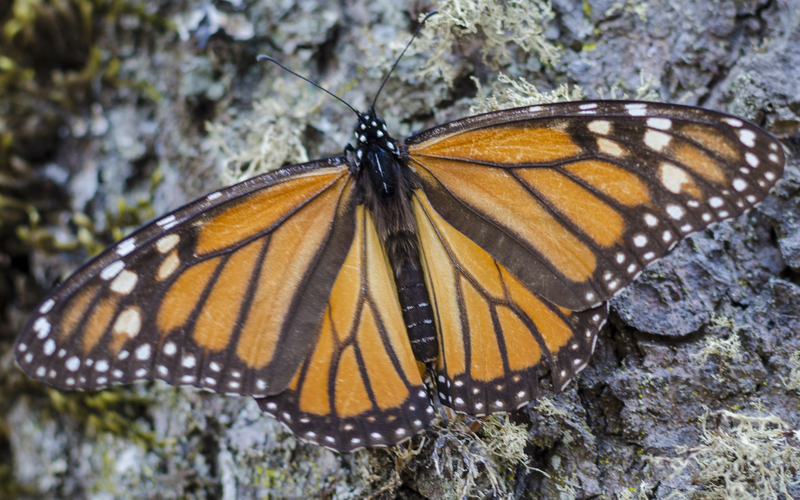 The rest of our neighbours had already headed south in search of warmer weather, and we hoped to find it too. 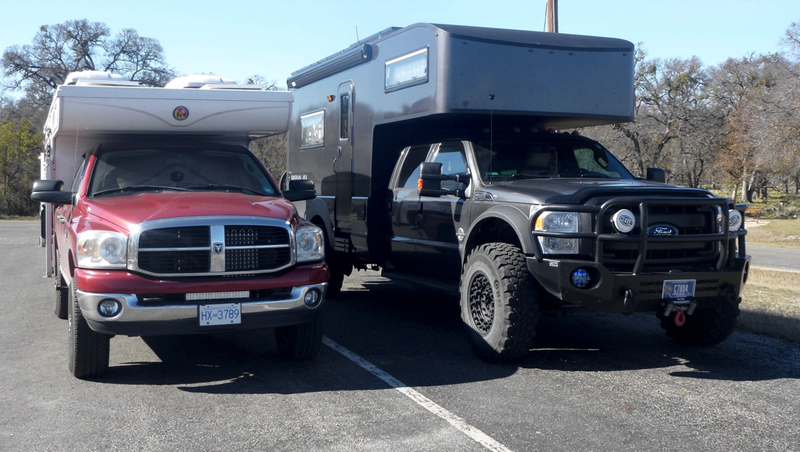 It is always fun to see other interesting rigs on the road. 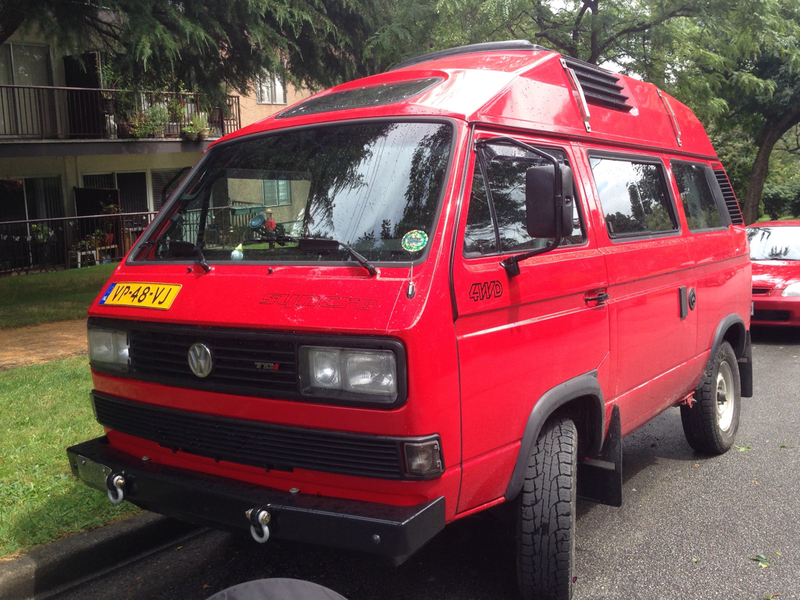 I saw this beauty in Vancouver couple weeks before we hit the road. I wish we have these Iveco/Bimobil combo in North America. Awesome looking rig! This Buick proves that you don't need 4 Wheel Drive to overland in style. This Siberian totally dwarfs our Machete. Impressive looking thing. We met this couple from Colorado in Loreto, Baja, Mexico. 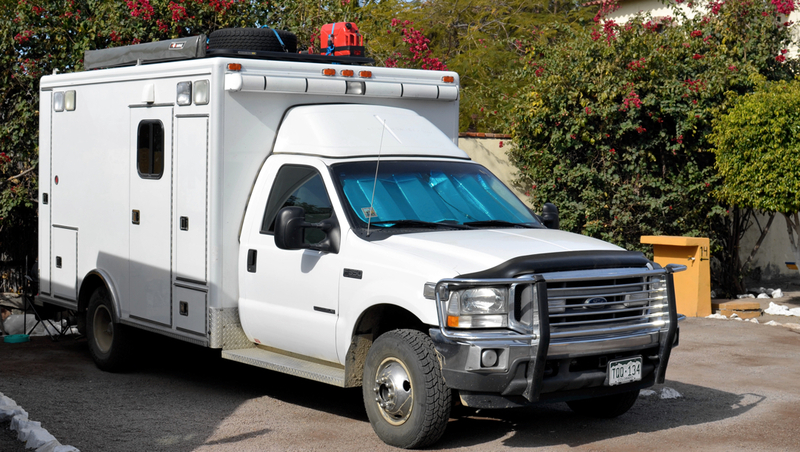 They converted this ambulance to a great looking overlanding rig. 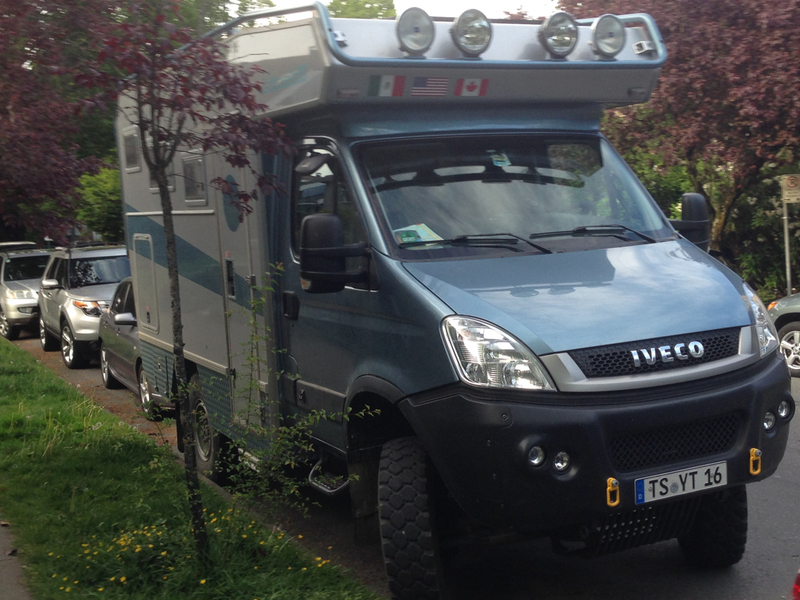 Custom made 4x4 Sprinter from Belgium. 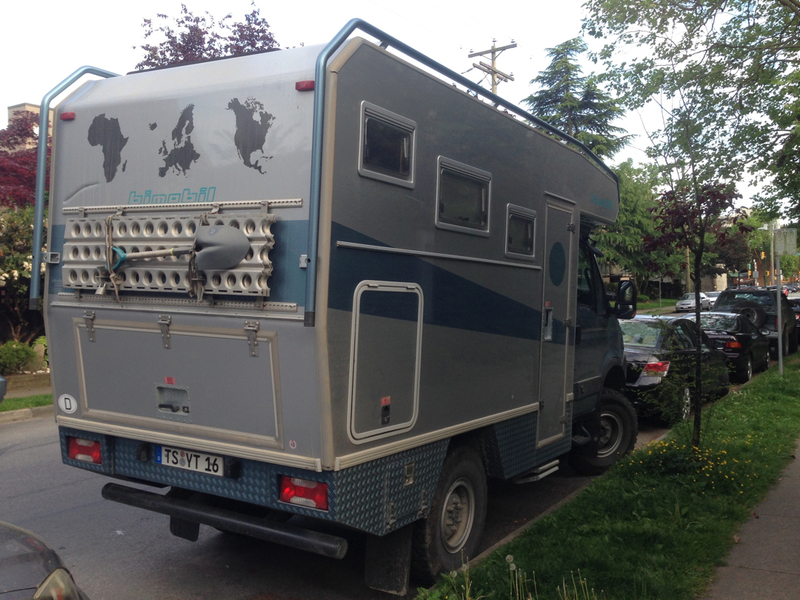 This couple have been on the road last 10 years, zigzagging the Americas. 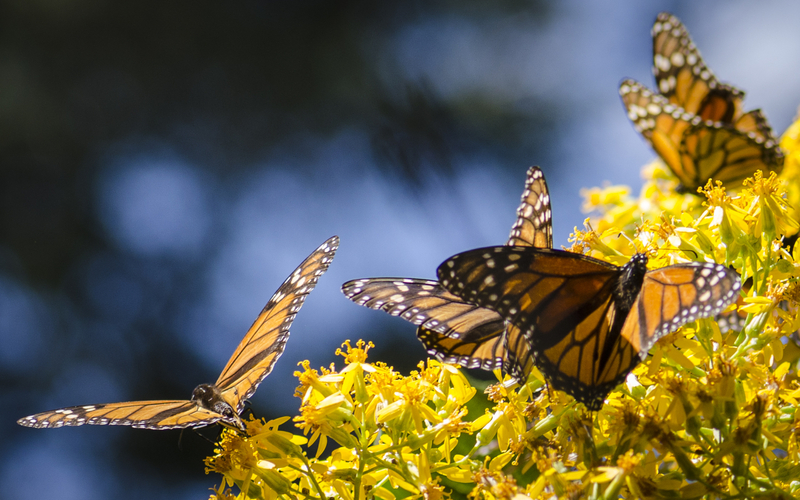 We met them on the way to Aqua Verde, Baja, Mexico. The gentleman has been paralyzed last 19 years. He built this beautiful looking rig himself. 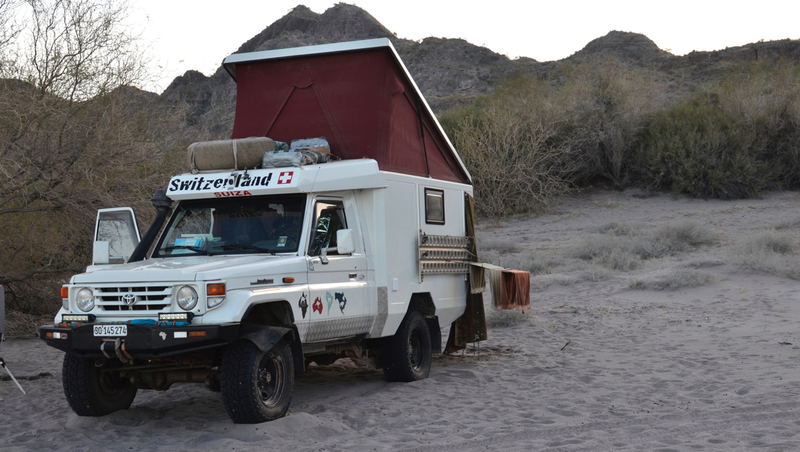 This couple from Switzerland had been in all over Africa and Australia before they shipped their Toyota to South America and made their way to Mexico. Inspirational. 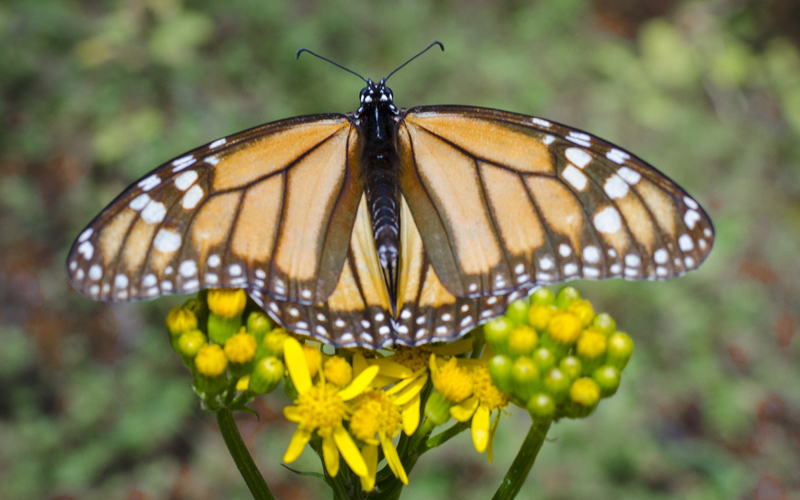 This LT from British Columbia was on sale in Todos Santos. Photos are now working, and they're great! 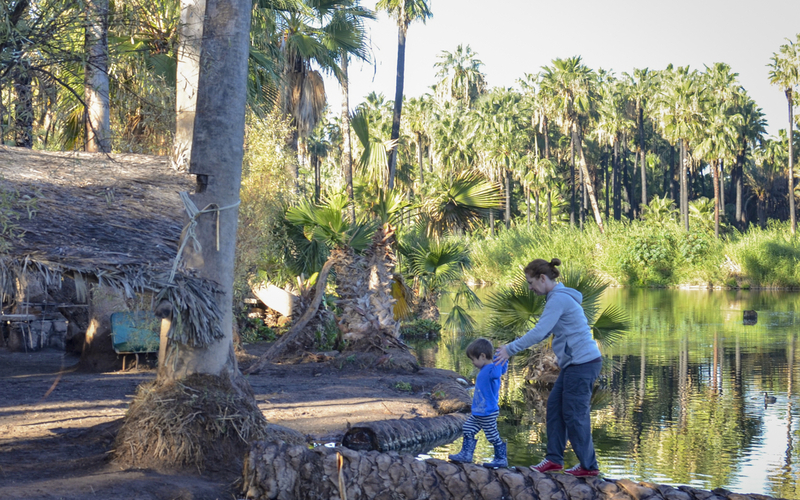 After our lazy days in Bahia Los Angeles, we were ready to find some adventure. 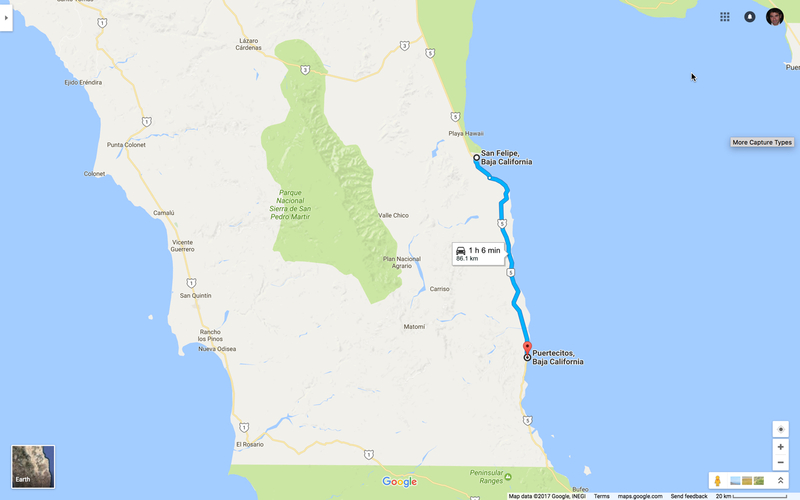 We thought of taking the road south along the Sea of Cortez, but we couldn't find any information on how far it went, or it's condition. Only one guy said he'd been down that way, but only for about 5 miles outside of town. I was secretly loving the idea of taking the road, thinking the road itself would be a great adventure, and we'd certainly get to finally test out the sand ladders. But taking that road also meant we were sure to get lost, and possibly spend hours stuck, and possibly be stuck in the middle of lord knows where at nightfall. So, our cautious side won out, and we headed back to the main highway, Mex 1, to continue our journey south. 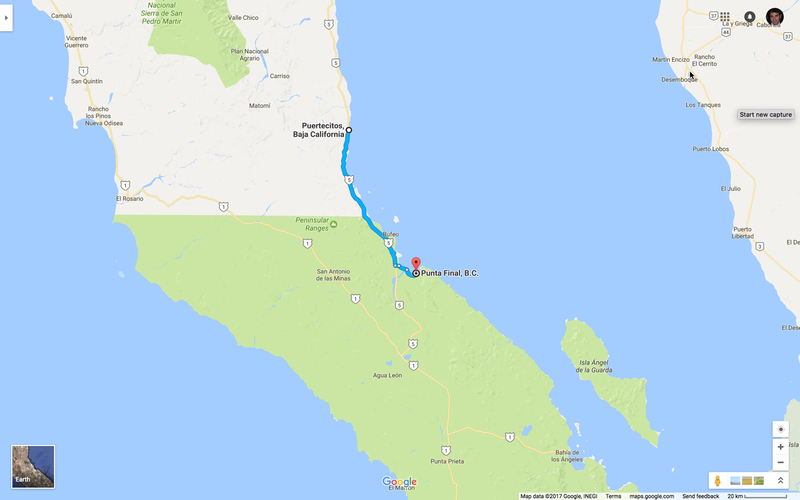 We set our target on San Ignacio, because our brains had been wired to think we had to stay on the Sea of Cortez, and that was about as far as we could drive in a day. 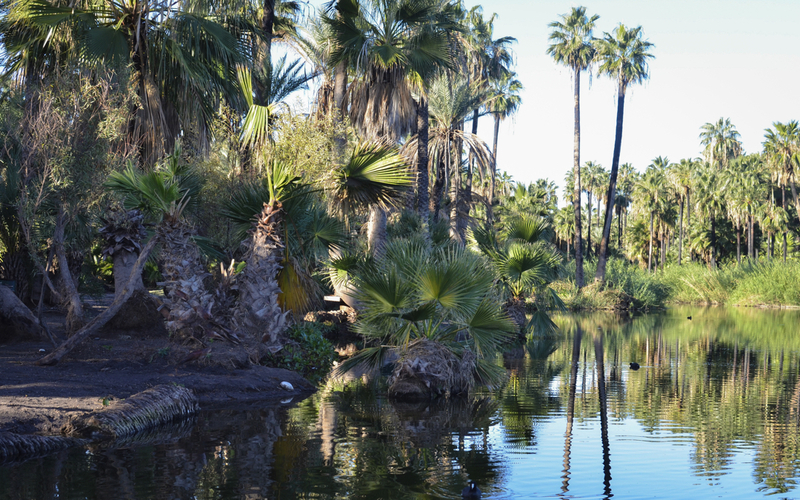 We were stunned when we arrived after hours of desert landscape, to find ourselves in a jungle like Oasis. We obviously didn't do our homework on this one, or even look at any photos, because the change in environment was a great surprise. 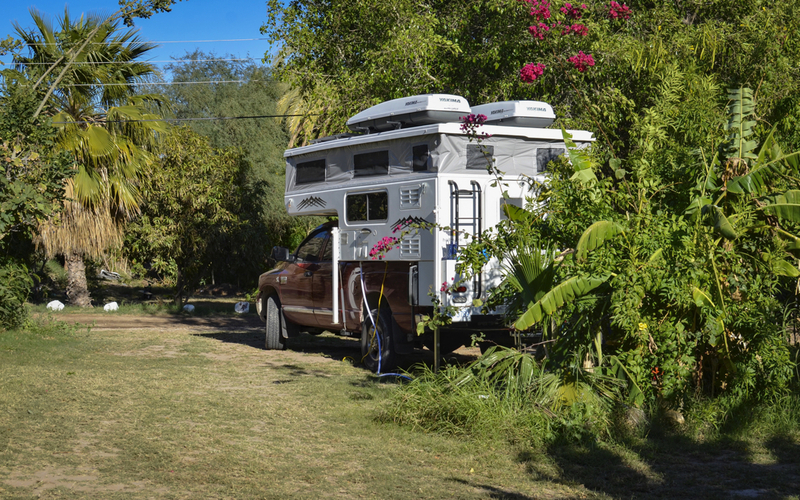 San Ignacio is near a lagoon with amazing lush green foliage and palm trees. Because of recent rains, the campsite was extremely muddy, and we took an ungodly amount of time choosing our spot. I wanted a site that had the a perfect view, and Okan wanted a spot where our tires wouldn't sink too far into the mud, and he didn't have to deal with trying to level the camper. It would have been much easier for us to pull forward into the campsite, but there was no way I was going to be satisfied with our camper door opening out onto anything but that gorgeous lagoon. Indigo was oblivious to our struggle over how to park, because there were little black ducks everywhere that needed his immediate attention. I found some old bread for Indigo to feed them, and discovered they were rather aggressive and not so kind to each other. I immediately had to step in and try to make sure some of the outcasts could get in a bite or two. I don't think Indigo noticed the social dynamic going on at all, he was just happy throwing bread. 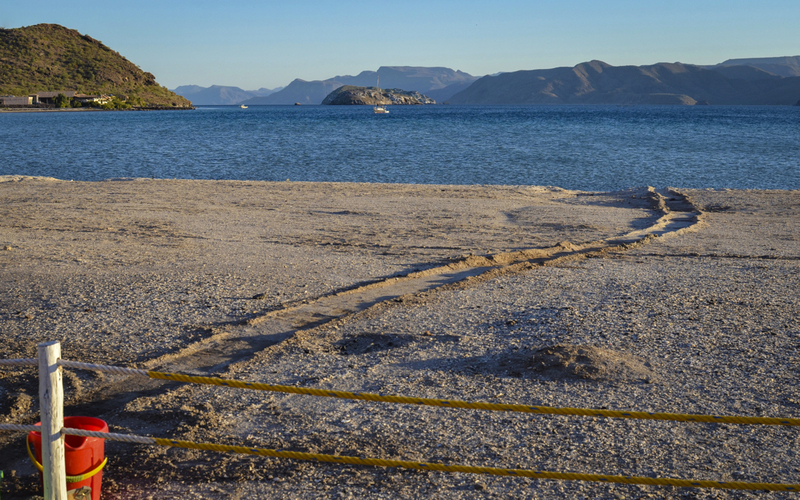 We really thought we'd be in and out of this campground and on our way back to the Sea of Cortez in the morning. 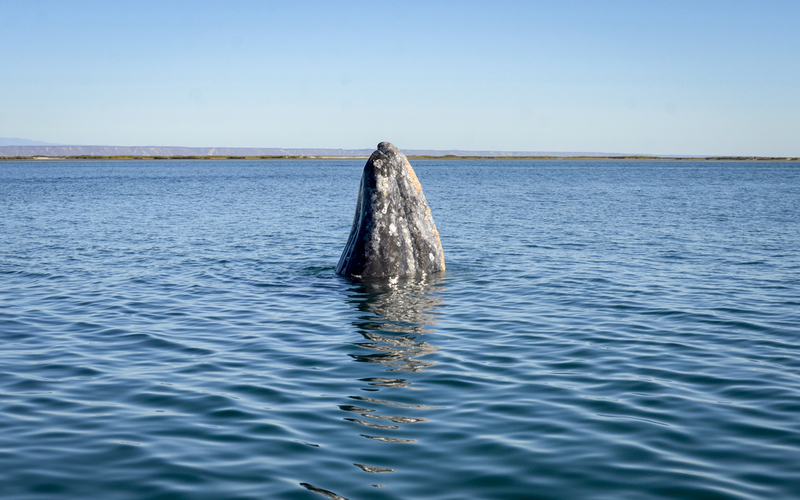 But we realized the whale watching season was unfolding, and for not too long of a drive, we could head further west and might be able to see some Grey Whales. Another camper pulled in just after taking their own whale watching trip that day. After seeing their videos of them actually petting the whales, we were convinced and decided to go in the morning. 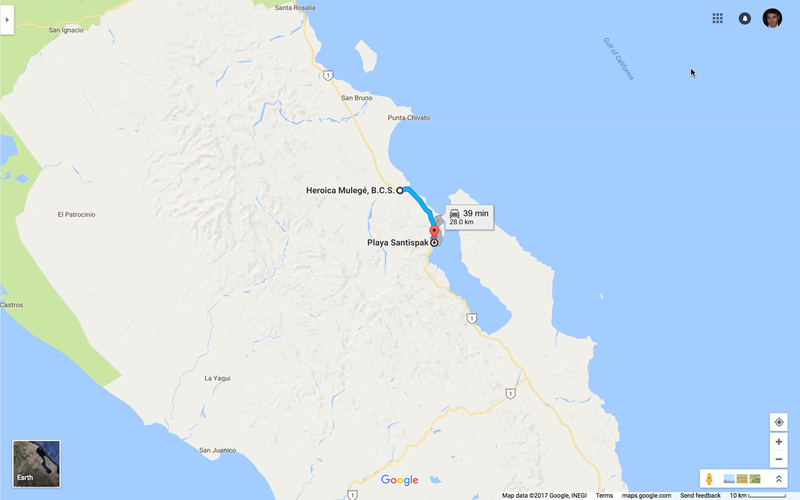 Early in the morning, we stopped in town to make reservations with Ecoturismo Kuyima then set off for San Ignacio Lagoon. The road seemed really great, it was new and smooth, and then all of a sudden it wasn't great at all. It turned into the most absurd bumpy washboard sand road just a stones throw from our final destination, and it had our insides and our nerves shattered before we arrived. We showed our reservation papers to the first person we saw, who ushered us into a waiting area where they told us about the whales, the lagoon, and what we could expect. We were thrilled that it would just be the 3 of us on a small boat. That would reduce my stress levels greatly as I had no idea how Indigo would do for 90 minutes on the water. He seemed really pumped up for the trip, couldn't wait to get on his life jacket. But lots of our adventures start out great, but not all the endings turn out great. We had to wade out into the water to get into our boat, and then we were off. I don't recall our captain speaking at all, he just smiled a lot. The 15 minutes to get to the viewing area were a treat for Indigo, and the rest was a treat for me and Okan. The whales were literally all around us. We would motor close to one and see if she wanted to stay around, or leave. Many of the whales actually push their babies towards the boats. The funniest part for me was watching the mother whales come straight up out of the water and stare at you with one eye, which is just beside the end of their mouth. She would sink back down quietly into the water, and after deciding you didn't look suspicious I guess, would swim over with her baby beside her. We heard that these whales can sense good auras, and are especially attracted to boats with children. Stories about whales leaving as soon as couples started bickering were recounted to us from the guide. I kept thinking, &#8220;oh crap, the whale is going to know if I get annoyed on the boat, I won't be able to hide that from the whale, but maybe Indigo's aura can balance all that out.&#8221; I was painfully aware of bigger smile and perhaps over the top cheeriness, each time a whale was deciding to stay or go. Then I started to wonder if maybe they tell guests this so that people will try to get along really nicely on the boat. After all, I'm sure the captain doesn't want to be around people bickering on in foul moods all day. We didn't get to pet any whales, but it was still a fantastic day. Indigo got bored in about 20 minutes, so I had to keep him from trying to get close to the captain to steer the boat and check out the motor, while Okan snapped as many photos and videos as possible. When it became clear that Indigo wasn't going to last much longer, as indicated by him trying to sleep on the floor of the boat, we asked the captain to cut the trip short and take us back. Back at the same campsite, we decided to walk into town for a bite to eat. The main town square reminded us of Savannah Georgia with it's huge trees outlining the centre square, across from an old mission church. I took Indigo into the church while they were having a service. 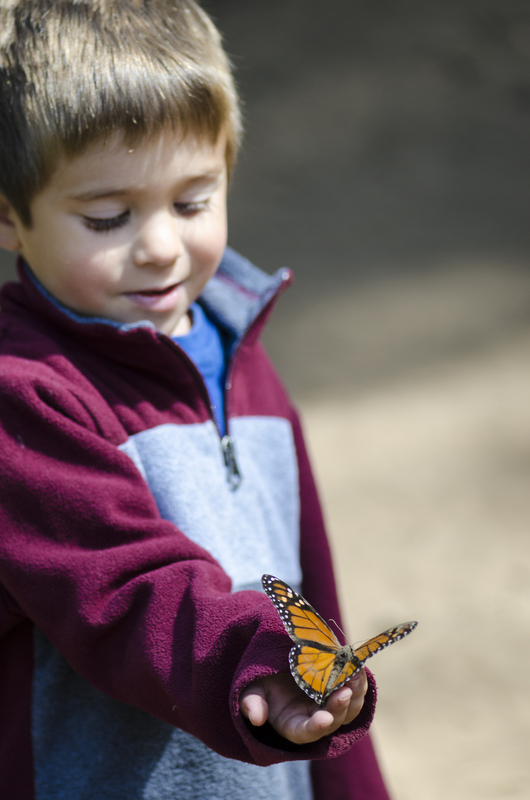 He picked up right away that he needed to be quiet, and sat amazed looking around. He immediately and instinctively switched to whispering. For those who do not know Indigo, he is pretty much always talking, and always talking loudly. One of our friends in Vancouver has always teased us about what she calls Indigo's only two volume settings: loud and louder. I guess if I would like some peace and quiet, we are going to have to visit a lot more churches. We had a lovely dinner while sitting at one of the restaurants in the main square. We enjoyed fish tacos again, while Indigo feasted on a hotdog that we got at a food stand next to the restaurant. We don't get to relax much, or eat out at restaurants, so this was quite a treat and deserving of our first beer in what must have been weeks. 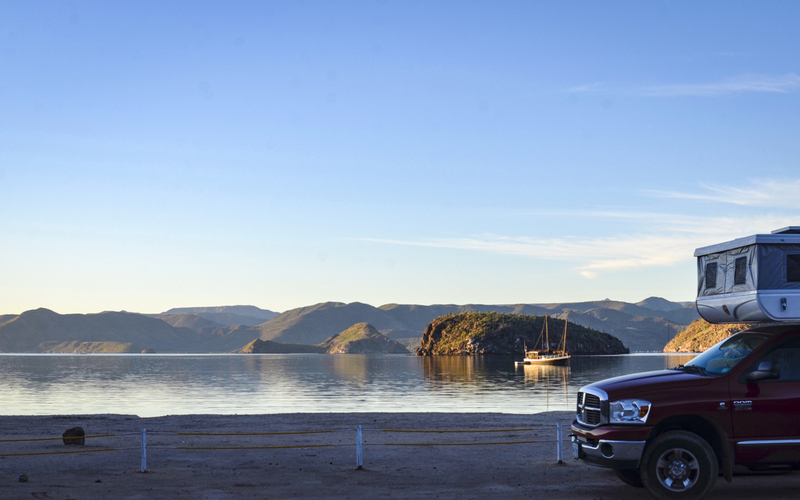 We got an early start in the morning to head back to the sea of Cortez. 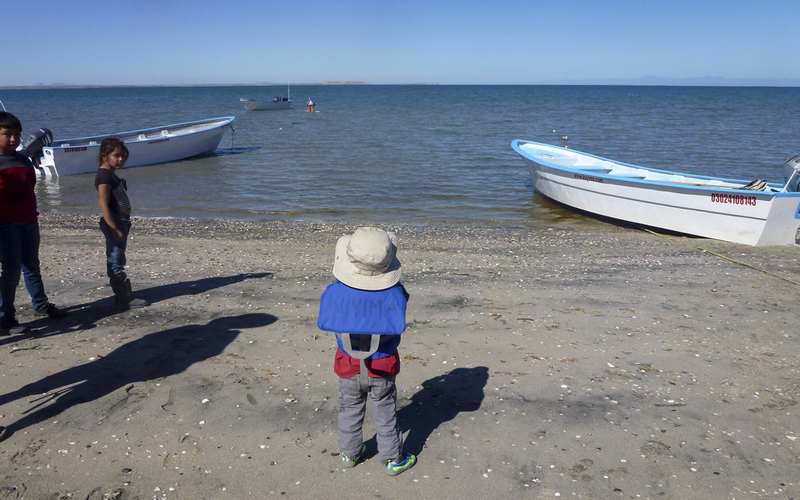 After our beautiful sunny day in San Ignacio Lagoon, we were looking forward to seeing that sun at the beach, enough to perhaps even get in the water with Indigo. 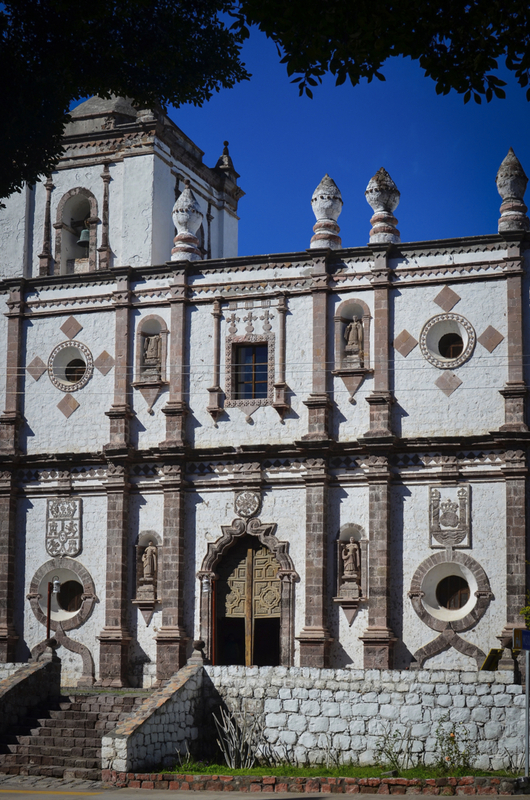 We thought we'd stop in Santa Rosalia, but just kept driving because even figuring out how to exit the main road into the town was too daunting. We were looking for a sunny beach, and we new we'd just get mired in the town, and probably get lost. Not to mention, Indigo was asleep as we passed through, and although he's not a baby, we've learned to let sleeping boys sleep when we have the chance. 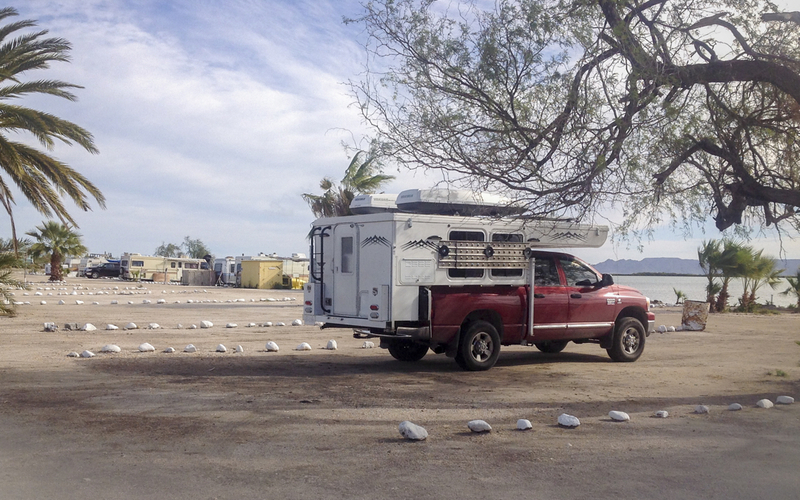 Before it got too late, we pulled off at San Lucas RV Camp and I just didn't feel &#8220;attached&#8221; to the place. 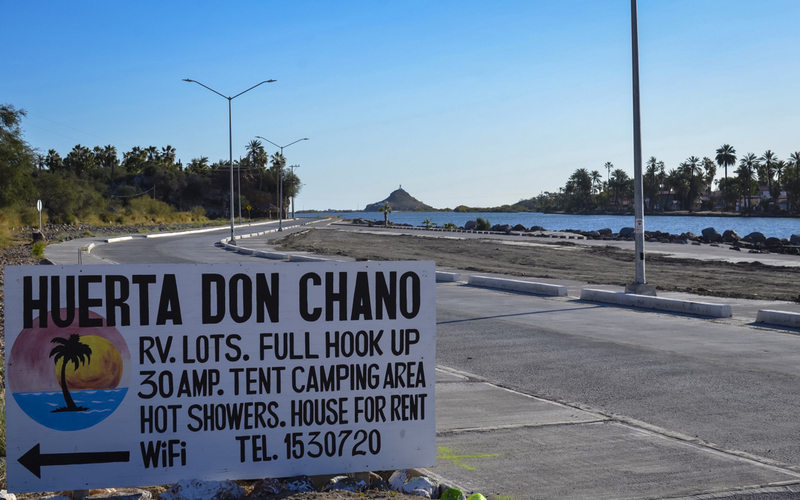 I made Okan drive to the other two camps to the North and South of San Lucas RV Park, but I felt even less attached to those two places, so back we went. The campground is 95% Canadian snowbirds, some of which have been coming for over 10 years, some who never left to go back home. They were a friendly group and even had twice weekly poker games. This was a fishing spot, and most everyone had their own boat. One gentleman offered to take Okan out the following morning because our little inflatable boat was not large enough to handle the wind and waves outside of the lagoon area. We had sun here, but it was really windy, and the beach area was more of a muddy swamp and not that enjoyable. After San Ignacio, it just seemed rather boring with nothing for us to do. 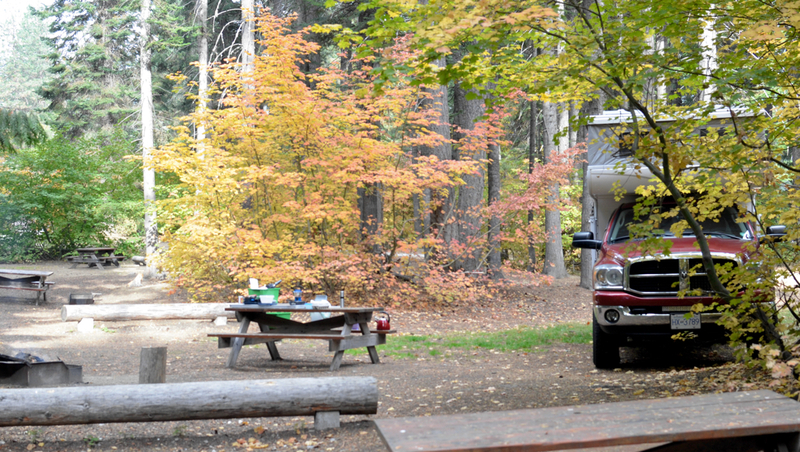 We only stayed a couple of days, enough to re-organize the camper and enjoy some hot showers. Indigo prefers bubble baths over showers, and we've found a way to accommodate him&#8230;for now. Great trip so far. Love to read about your adventures. Sorry to hear that you didn't get a chance to pet the whales, it is truly an amazing experience, but overall it looks like you had a good time. 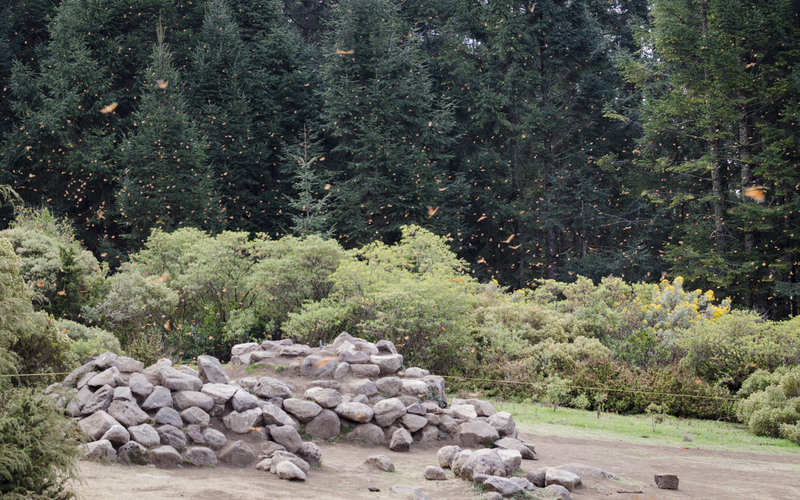 We drove up 10,000 feet on a bumpy road and hiked up another mile on foot to see these beautiful creatures at Michoacán, an Unesco World Heritage Site in Mexico. 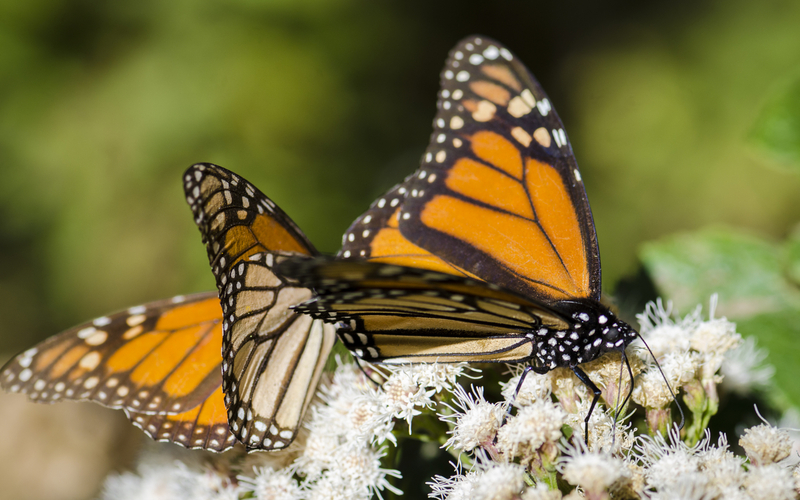 Most of the butterflies started their migration to Canada but there were still millions all around us. Amazing experience. But, the winds were so bad, that the thought of being whipped in the face with sand was definitely not something we were eager to experience. 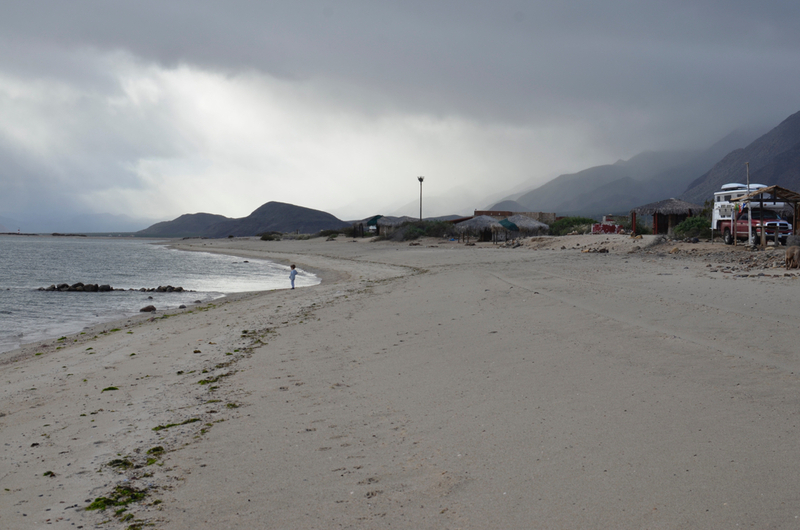 So we waited out the winds in Mulegé, just north of the bay. Mulegé was just a place to crash until our ultimate Baja destination, but Mulegé actually turned out to be one of our favorite places. 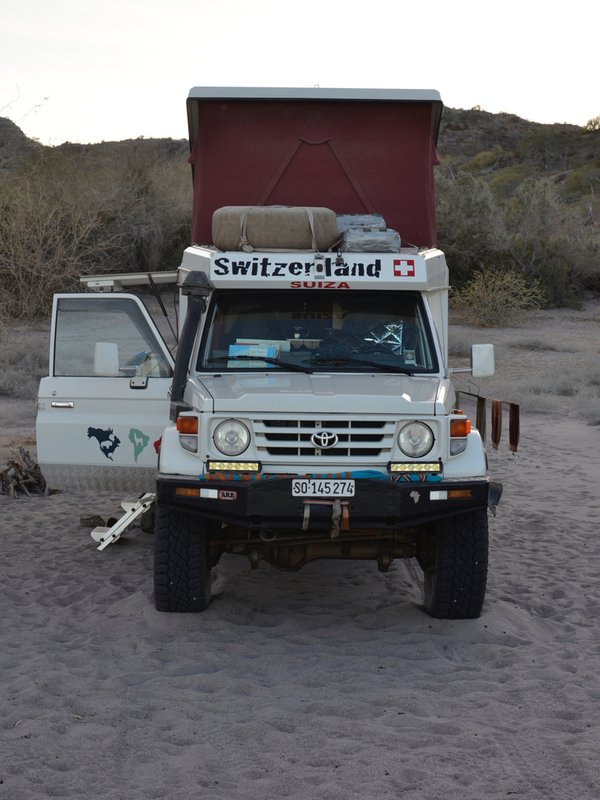 Every campground has a personality, and the one in Mulegé had a great one for us. The campground was near the river, green, surrounded by fruit trees, and inhabited by a group of regulars that held bocce ball games at 4pm each day. Town was a short walk away. As per usual, there was a collection of Canadians, with some Americans sprinkled in, and several Mexican locals. We secured a spot under a great shade tree. 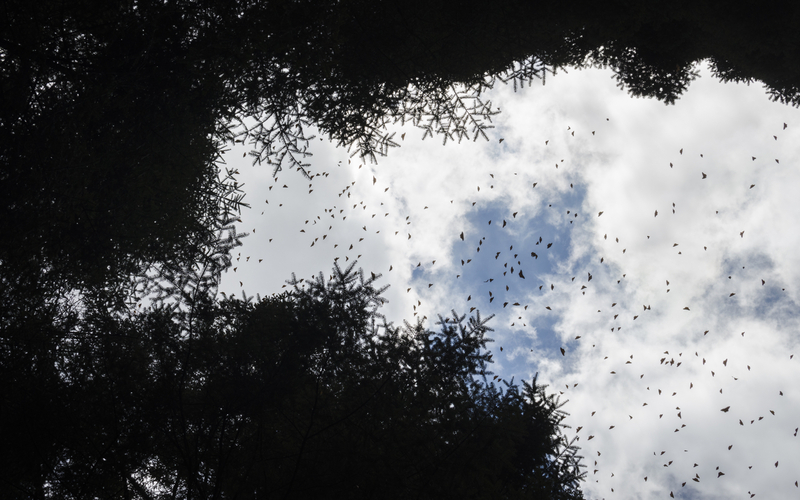 It seemed like the perfect idea, but we didn’t account for the branches scraping against our rooftop, and nuts falling on our heads at night due to the strong wind. When you are just inches away from your bedroom ceiling, these things become important considerations! But no matter how many times I eyed the other campsites, I didn’t ask Okan to relocate us. Okan took out his fishing gear for the first time here. He caught a fish on his second cast, and things were looking optimistic! But for us, it seemed like that just meant there was nowhere to go but down. On a subsequent cast, Okan ended up hurling the entire pole into the air, which left me in a fit of laughter. 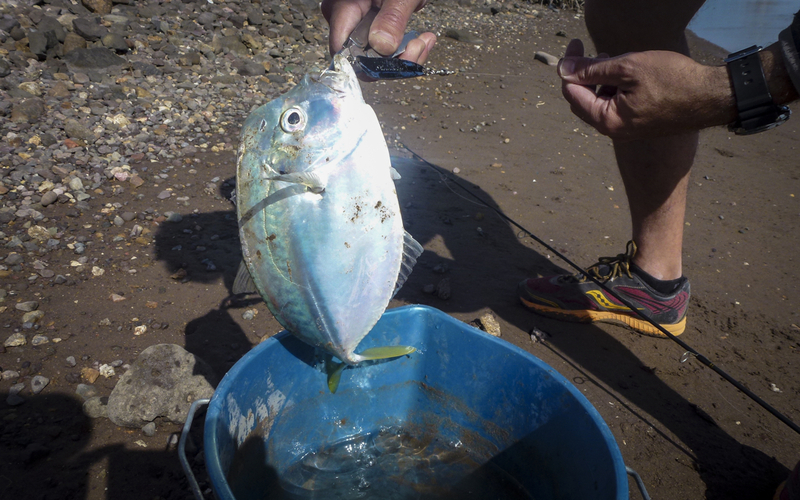 But I faired no better, as I almost immediately managed to whack Indigo in the head with the lure during my own ill-timed and ill-aimed cast. After tending to some tears and checking for hook marks in Indigo’s head, I then proceeded to lose the lure in the river. I decided to retreat back to camp with Indigo, and when Okan returned he still had one fish, and was missing yet another lure. 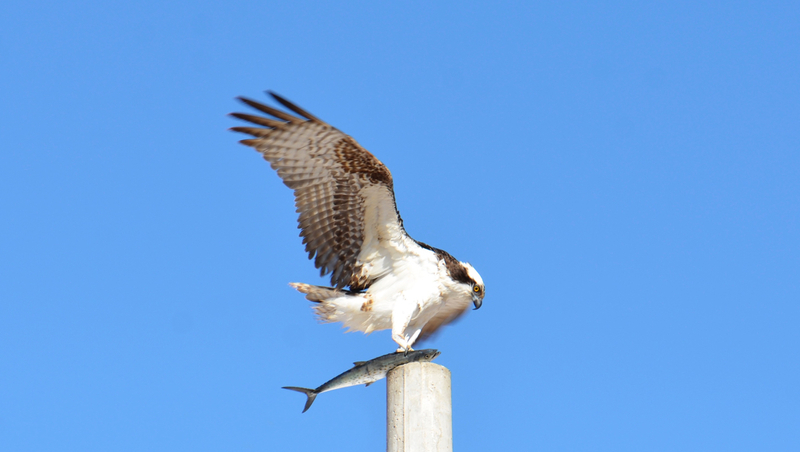 We shared the only catch of the day, and week, with enthusiasm that night. 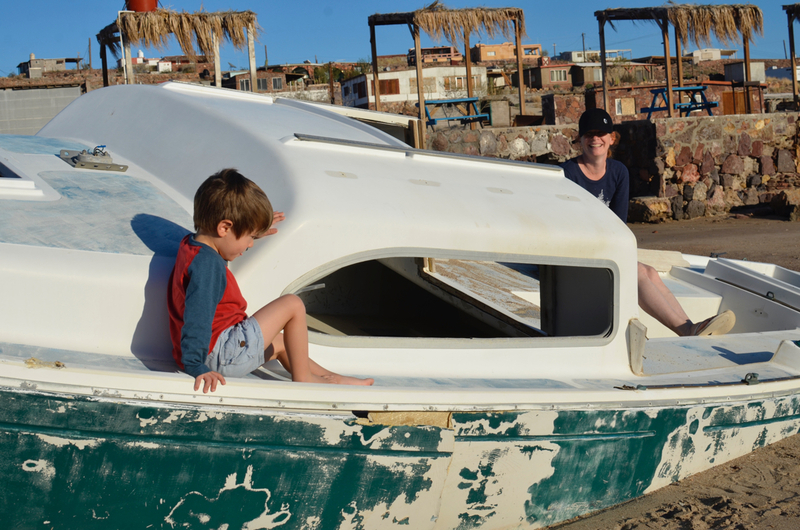 Another reason Mulegé was great for us, is that Indigo met another little boy who happily shared his toys. The two dug holes together for hours, but his favorite activity was taking turns riding the toy ATV. It was bittersweet for me to watch, as the full days of happy play with lots of laughter, turned into an evening of tears as Indigo didn’t want to leave and come back to the camper. 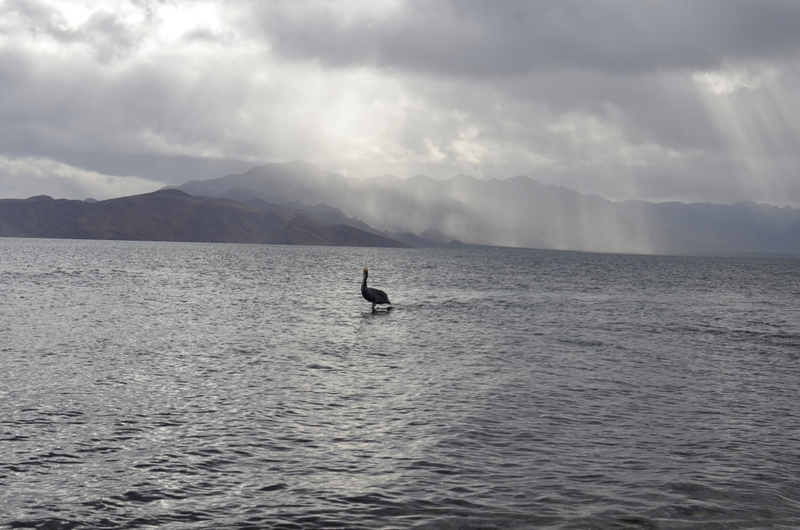 Since winds died down and the fish disappeared, we packed up and headed off to experience all that was Bahia Concepcion. On the drive down we saw the first beach, it was huge and had beautiful water…but was lined with what seemed like bumper to bumper huge RVs, the entire length of the beach. That didn’t strike us as the atmosphere we wanted, so we continued down the road, looking down from the cliffs hoping to scout out the other beaches. The other beaches were smaller, but were also packed with campers, giving even less personal space. After inspecting all of the beaches, we turned back and chose the first one…there were two restaurants on either end of the beach which started to seem appealing after seeing some of the pit toilets at the other beaches. I guess we we going to take baby steps towards full-on “wild camping” after all. We parked next to a family of Canadians who Indigo adopted immediately. 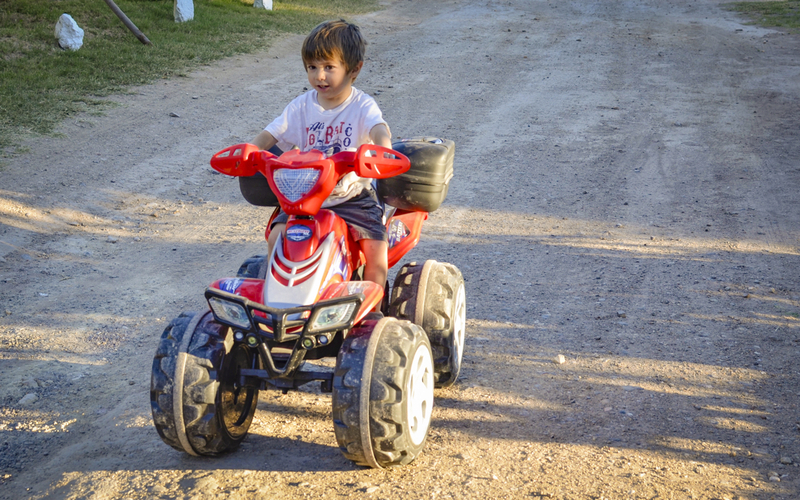 While we set up camp, Indigo was off on his first ATV ride with our new neighbours. Within 15 minutes, the fact that there were so many big RVs, lots of people and two restaurants behind us disappeared. 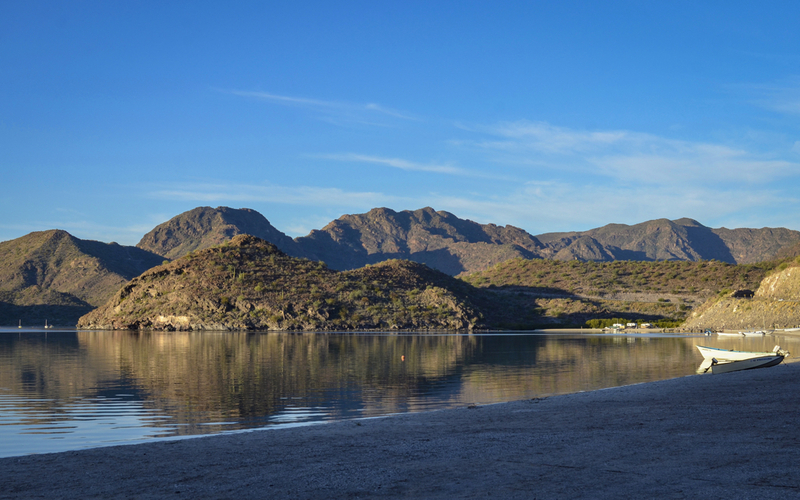 For our entire stay we simply absorbed the beauty of the area, the wildlife, and enjoyed the epitome of Baja. The beach had a fair amount of broken seashells on the side we were on, and was rather hot for little bare feet, so I embarked on making a private path for Indigo from our campsite to the water. We spent an afternoon together working on the path, and I was quite pleased with the results. The wind was not as bad as the week prior, but was still plenty windy for playing with kites. We took the boat out hoping for good fishing, but mostly to enjoy a boat ride together. Okan rowed us the whole way around one of the islands in the bay, while Indigo and I relaxed. A fisherman stopped by and asked if we needed a tow back to shore, as the wind was still strong and Okan was going to have a challenging time getting us back to the shore. But Okan likes a challenge, and in lieu of going to the gym, he rowed and rowed and rowed us back to camp. Back at the campsite, trucks would roll up and down the beach selling pastries and fresh seafood, vegetables, and fruit. This really is the best way to ease into wild camping when you don’t like the looks of what is in your camper’s pantry! Seems like the only wild part of camping we tested, was that we were self-powered, and had brought enough water for drinking and washing. Although Indigo thought pit toilets were cool, exclaiming “wow, this is a fancy toilet” as I stood by him with tissue over my nose nodding my head, we generally popped over to the restaurant to use their facilities. 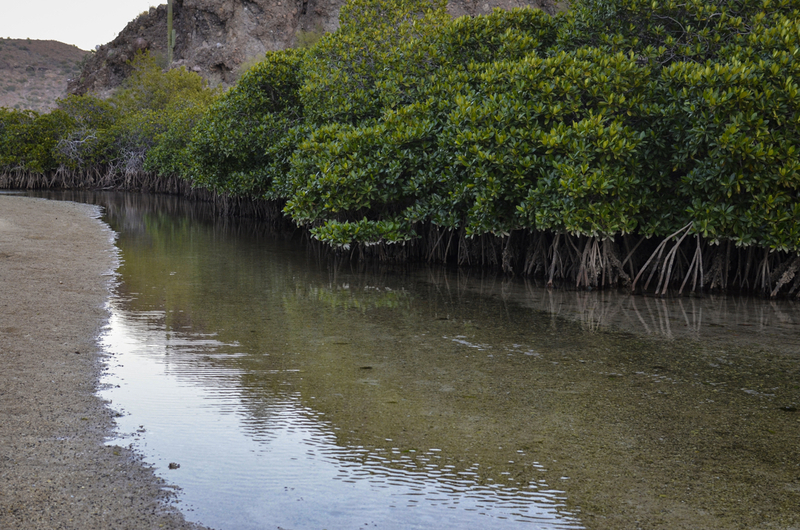 On our last evening, we decided to walk down by the lagoon, where the clear water of the bay continues into the pristine mangroves. As we passed by a family’s evening campfire, one of the campers came running towards us with something in his hand, and I thought we must have dropped something. But it turned out the camper just wanted to offer Indigo a chance at roasting a marshmallow. 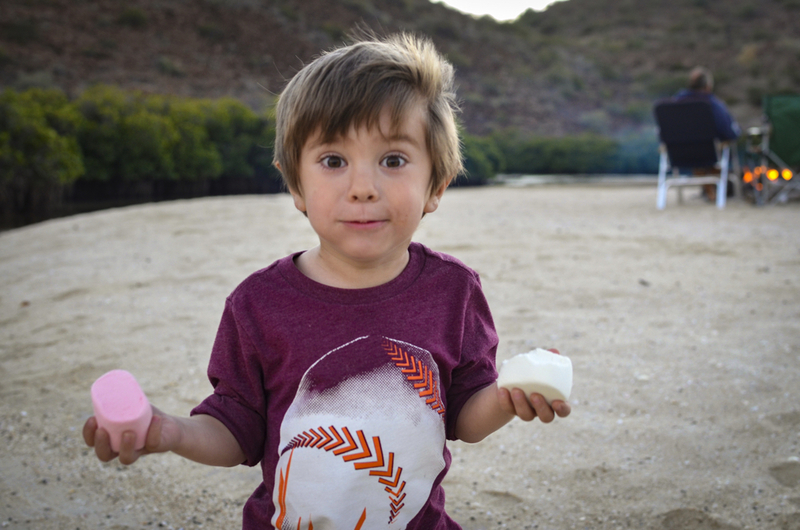 Indigo had never seen the giant sized pink and white marshmallows that are a staple here in Mexico, and was in heaven as he reached into the bag to pick one of each color. He opted for raw instead of roasted and immediately stuffed them in his mouth, while yelling “gracias”. Our first wild camping adventure was now complete.